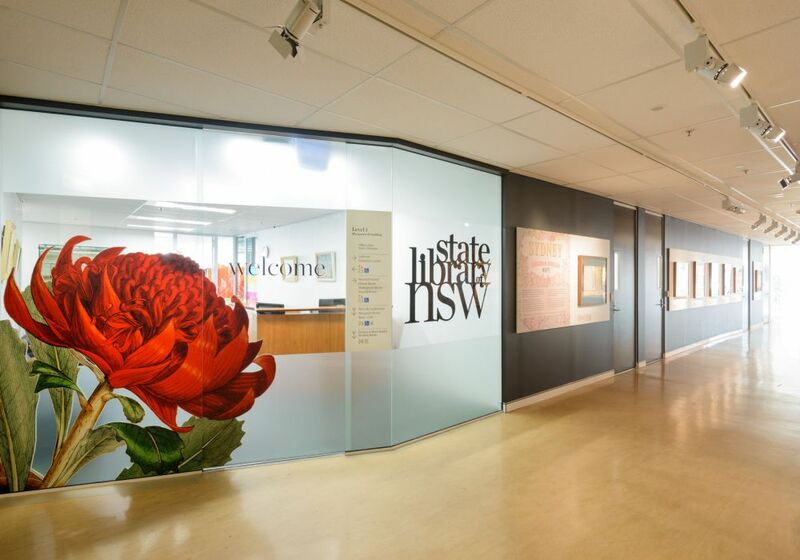 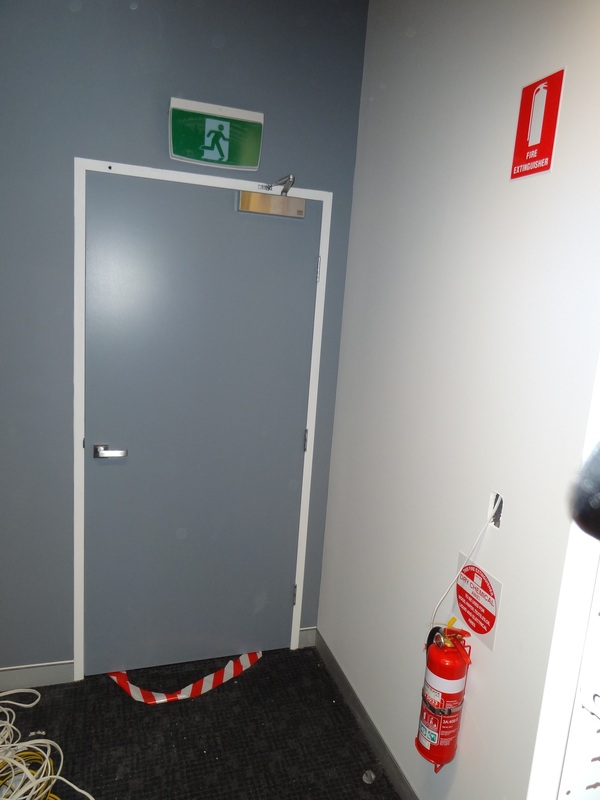 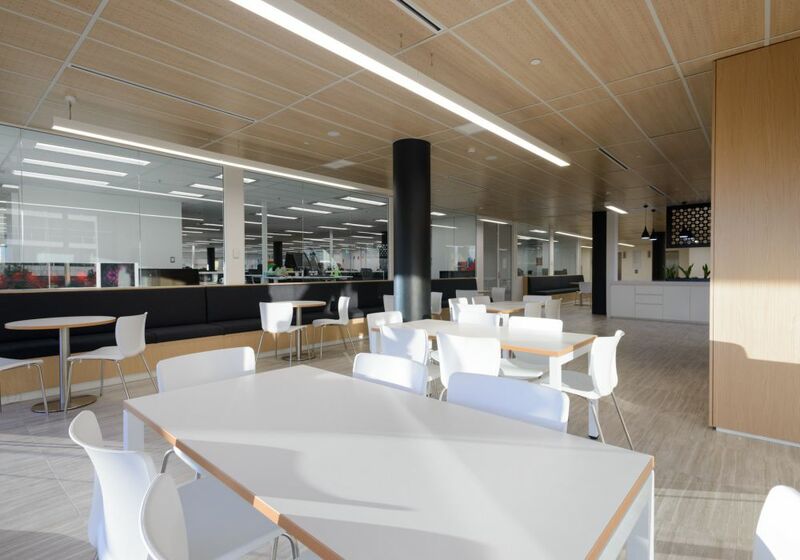 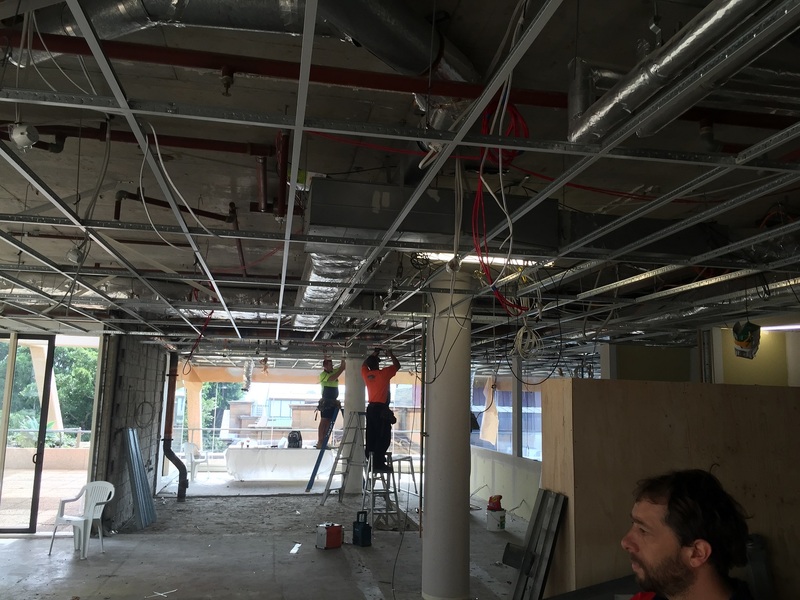 Complete demo and refit of levels 1 and 3 of the Macquarie Wing. 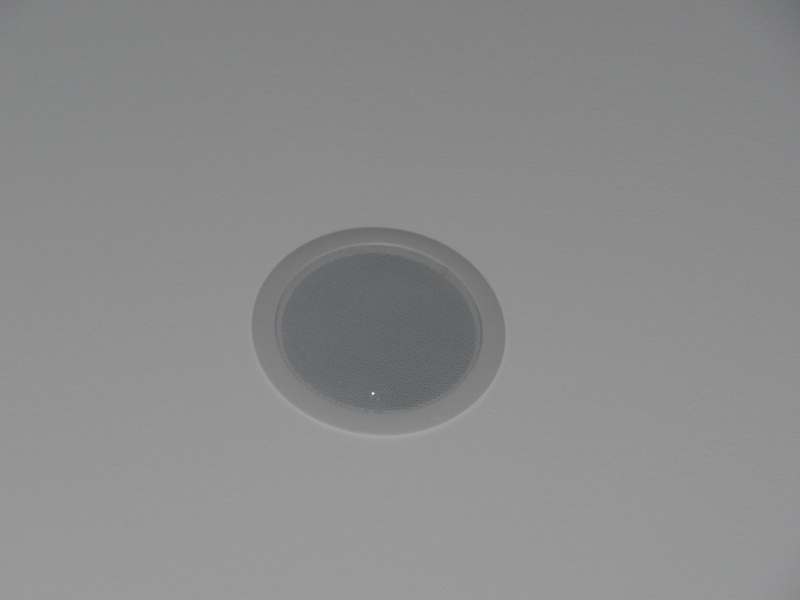 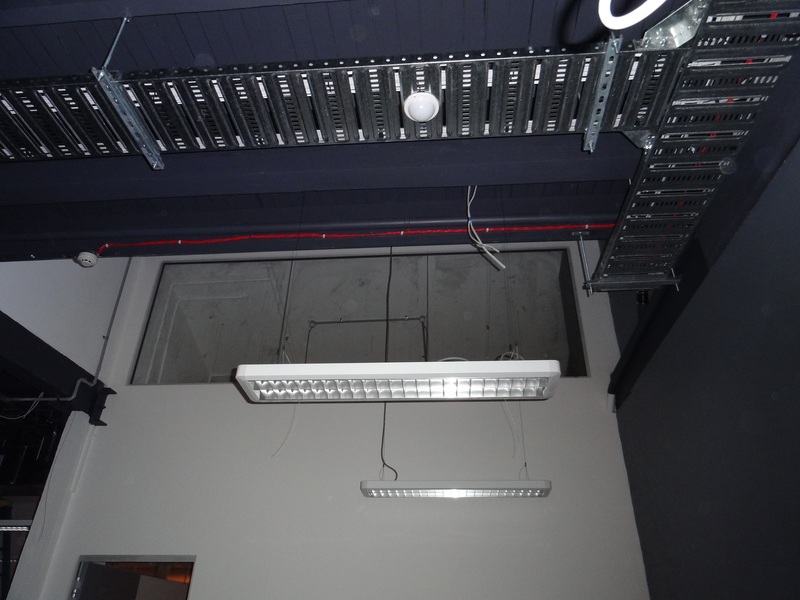 Supply and installation of over 300 dry and wet new devices. 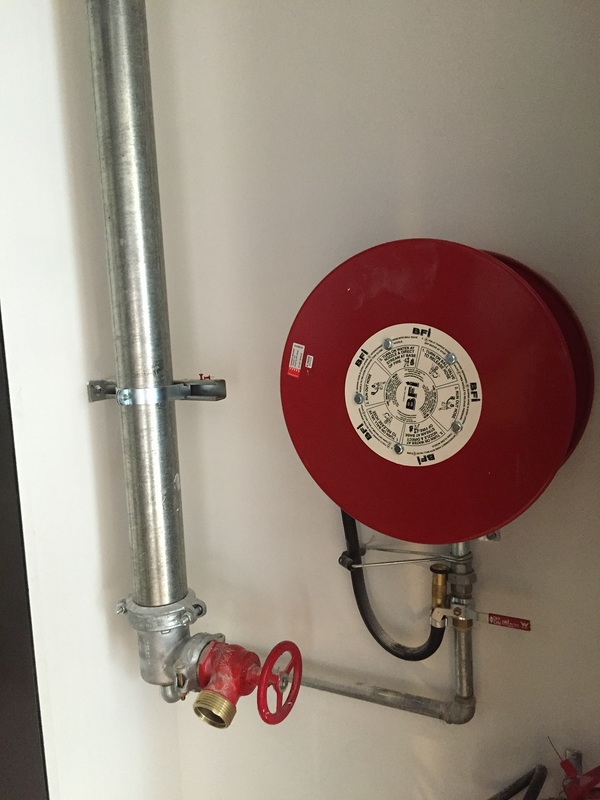 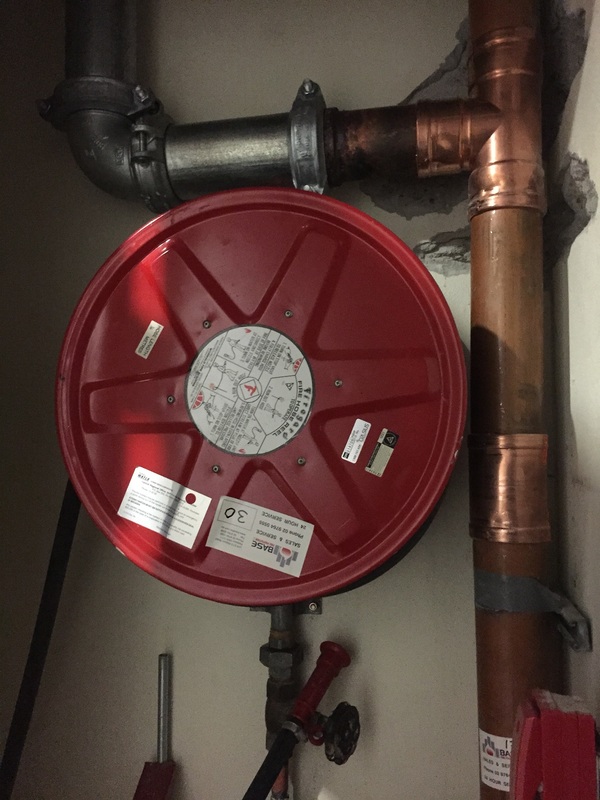 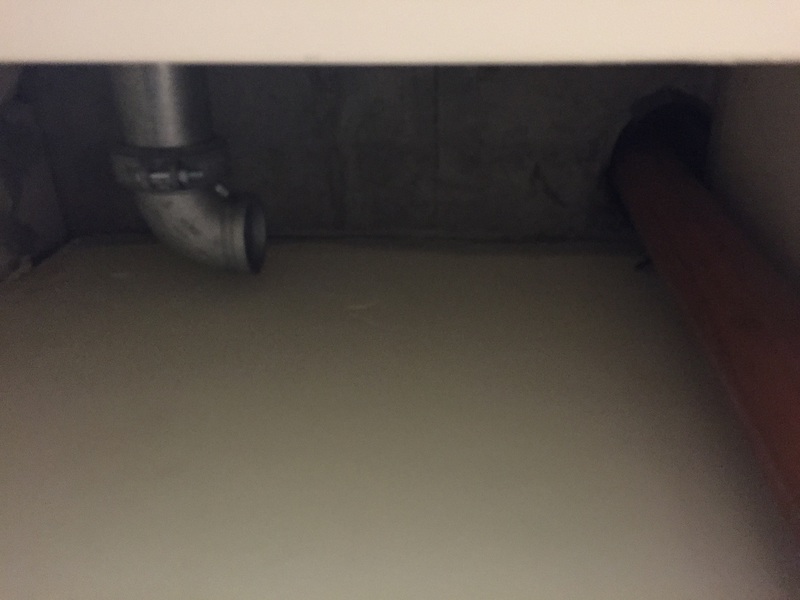 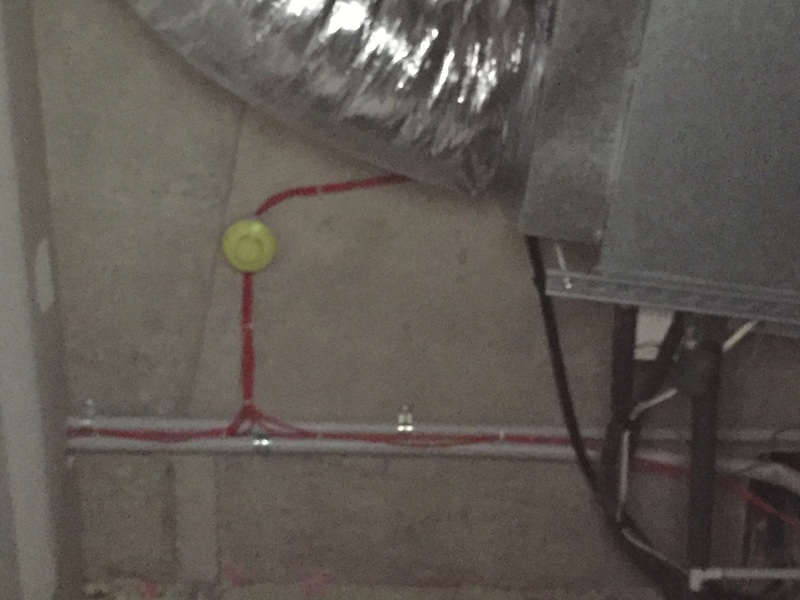 Travel distances required a additional hydrant landing valve and hose reel to a new location, the old copper pipe was ted off and gal pipe run above the tile ceiling to the other side of the floor. 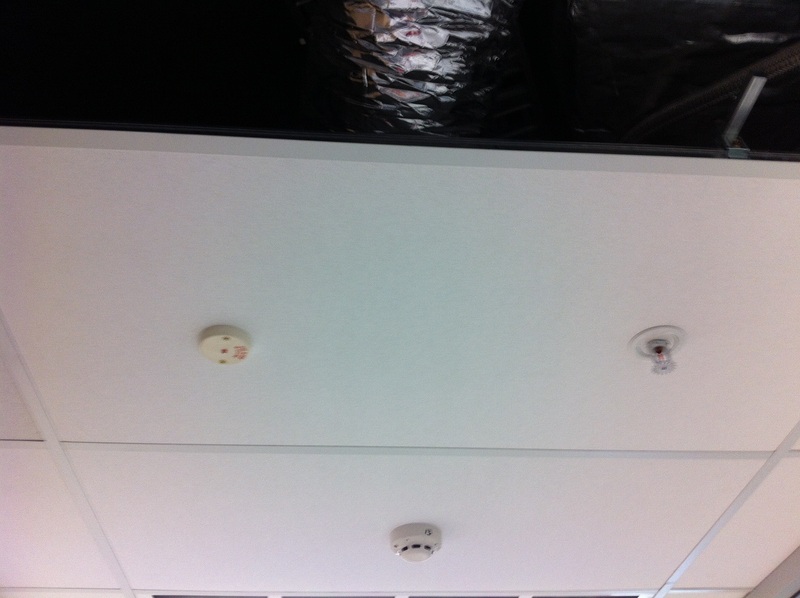 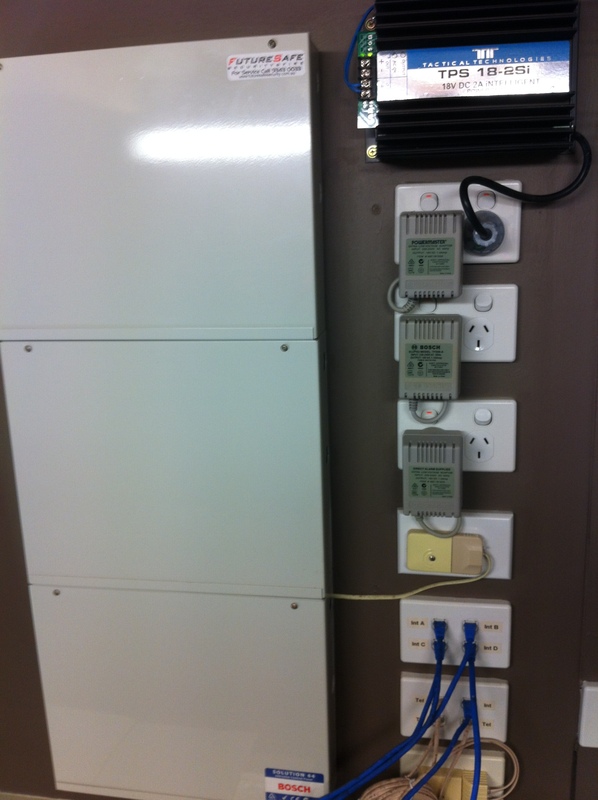 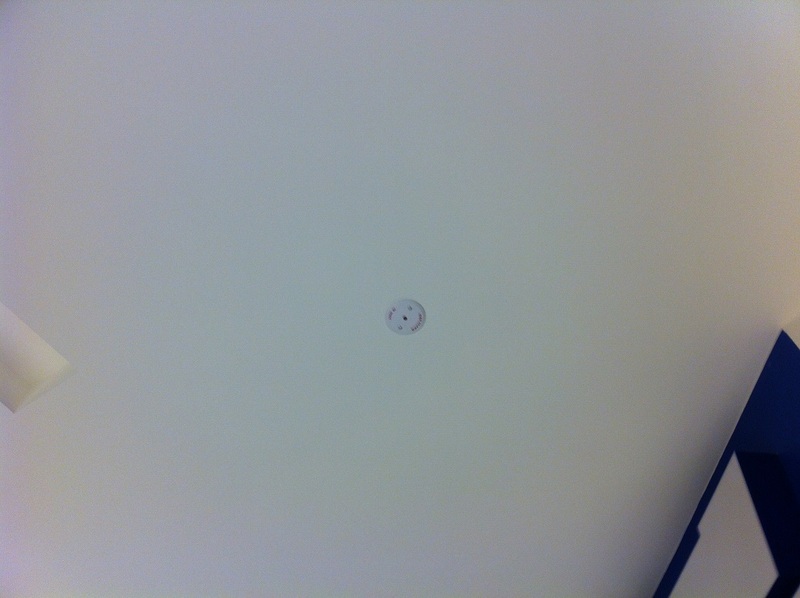 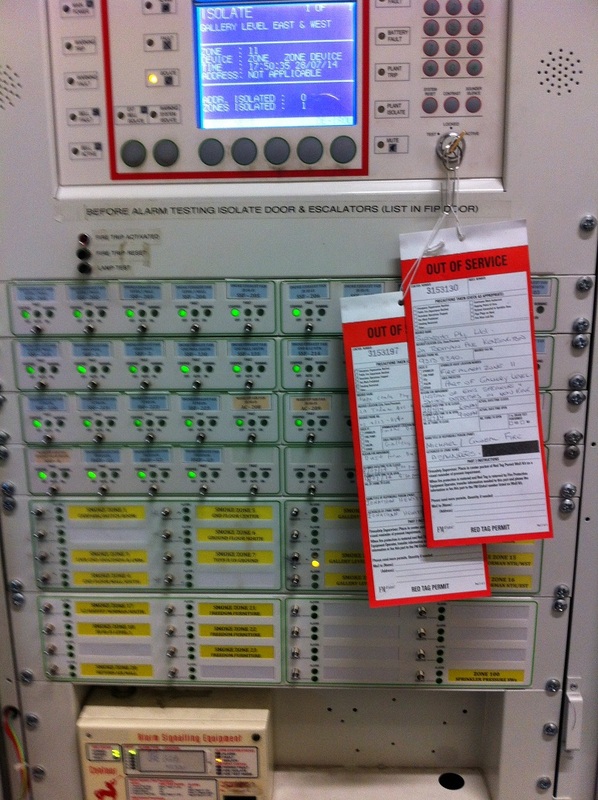 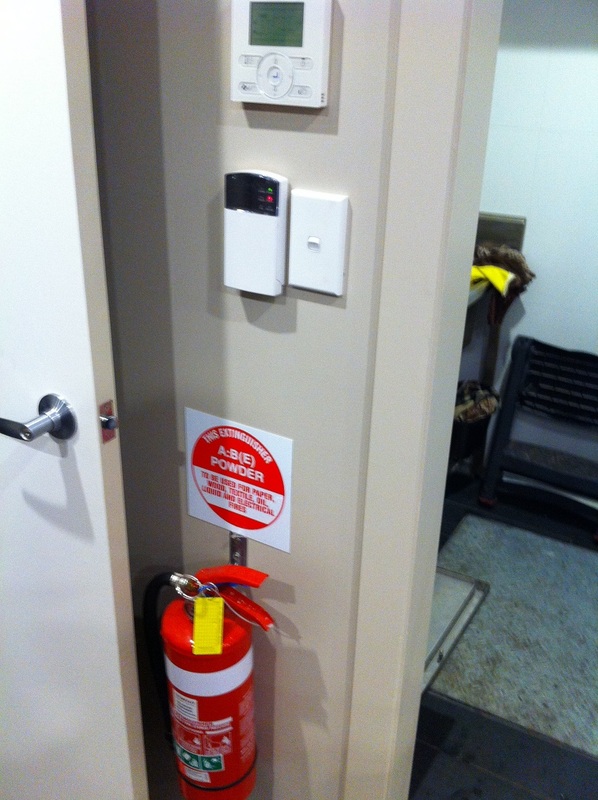 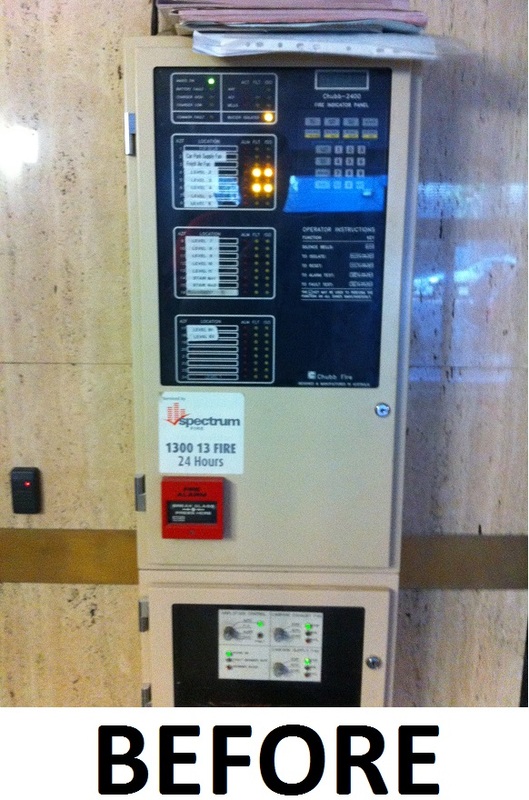 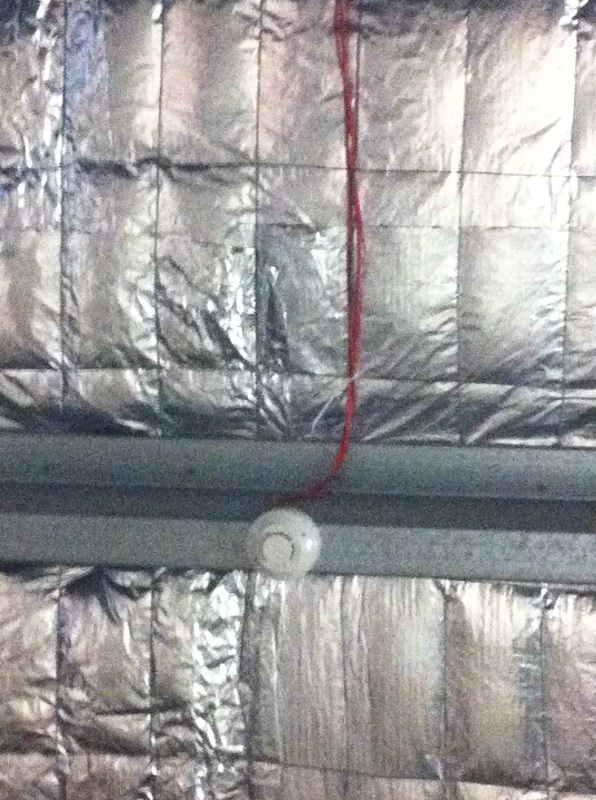 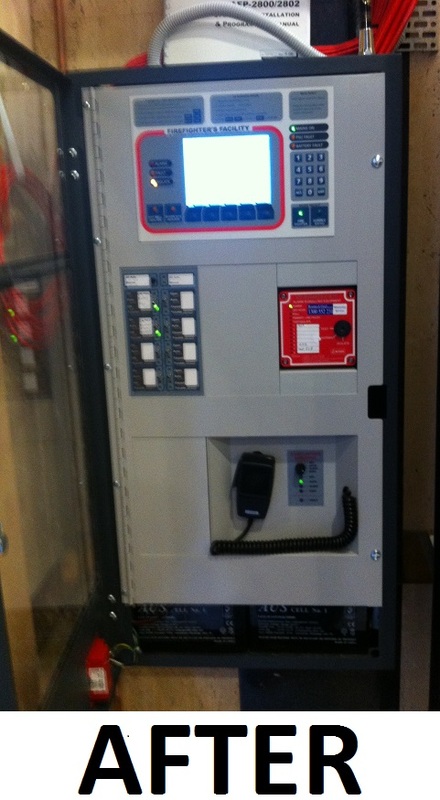 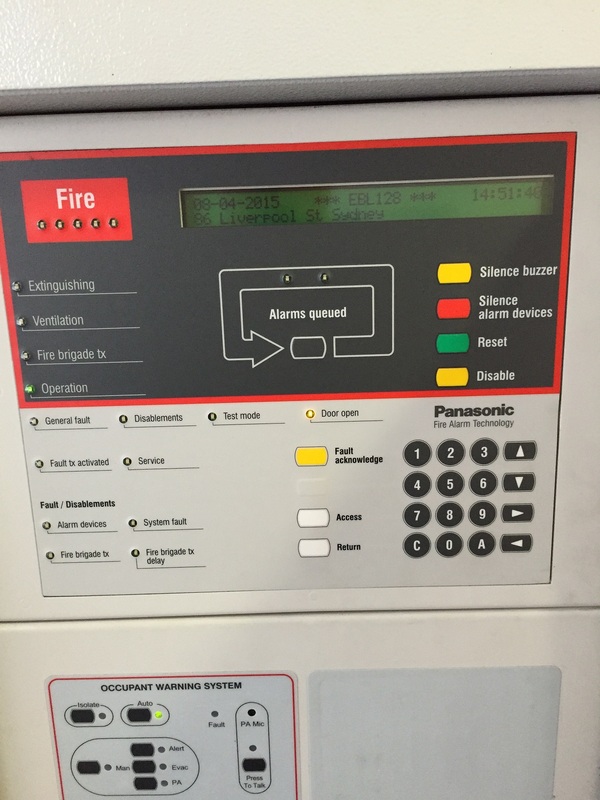 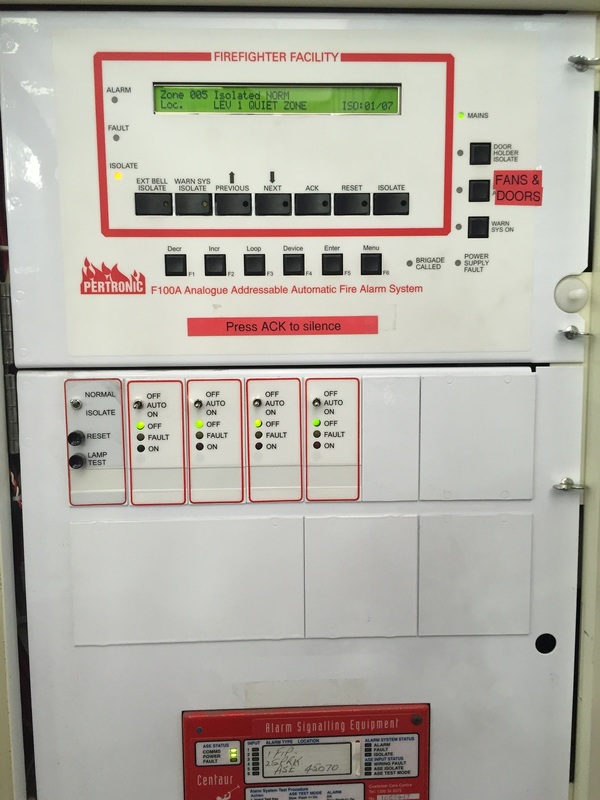 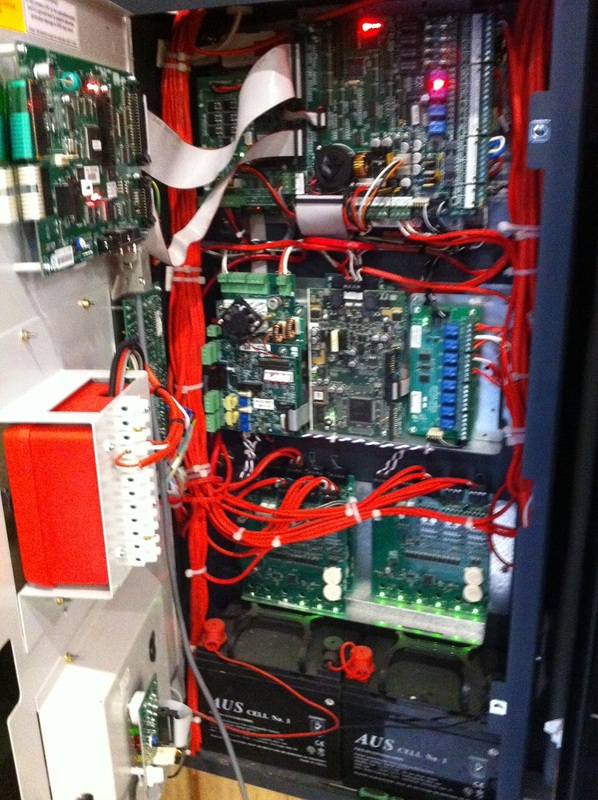 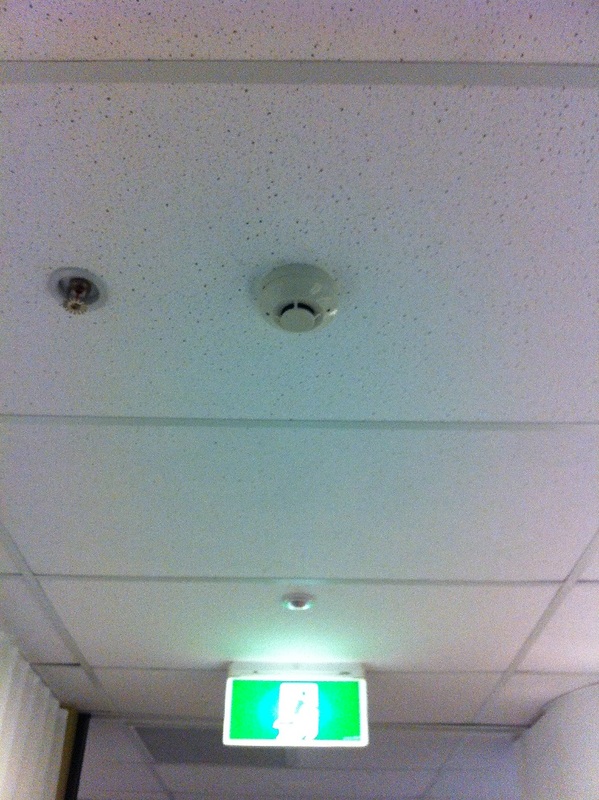 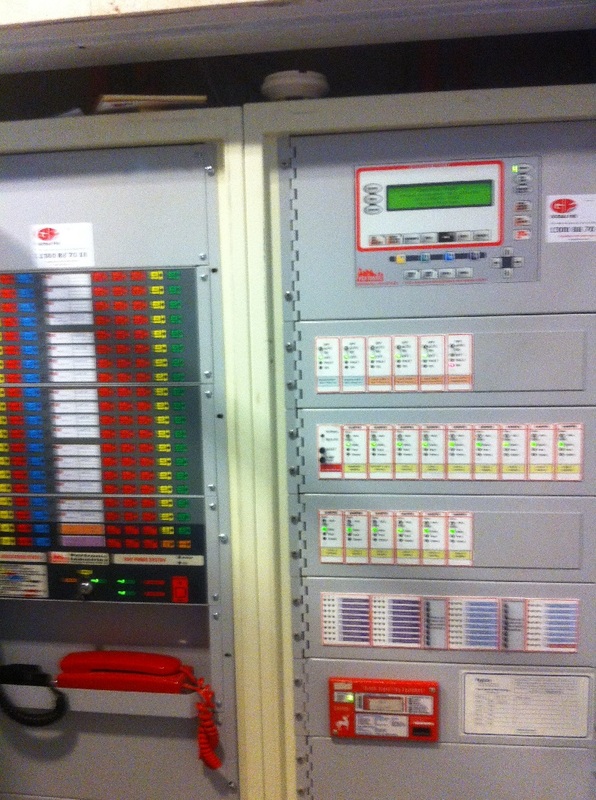 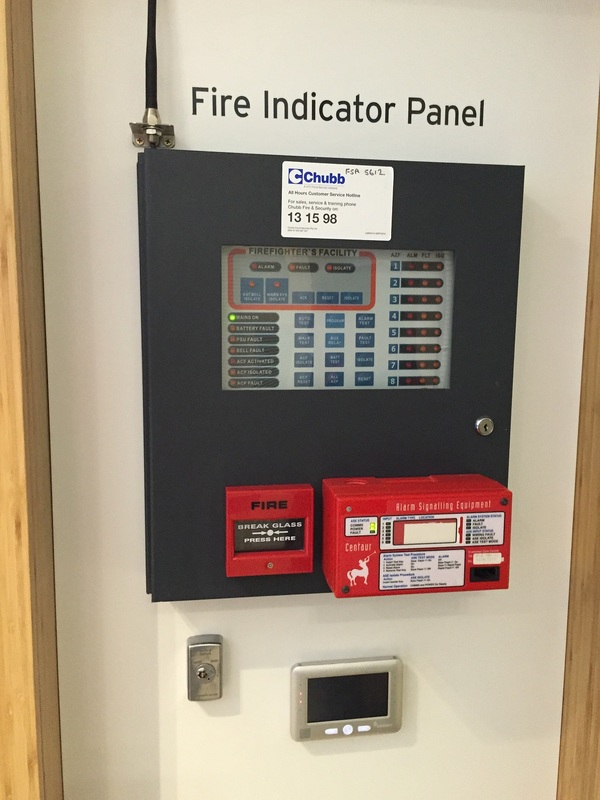 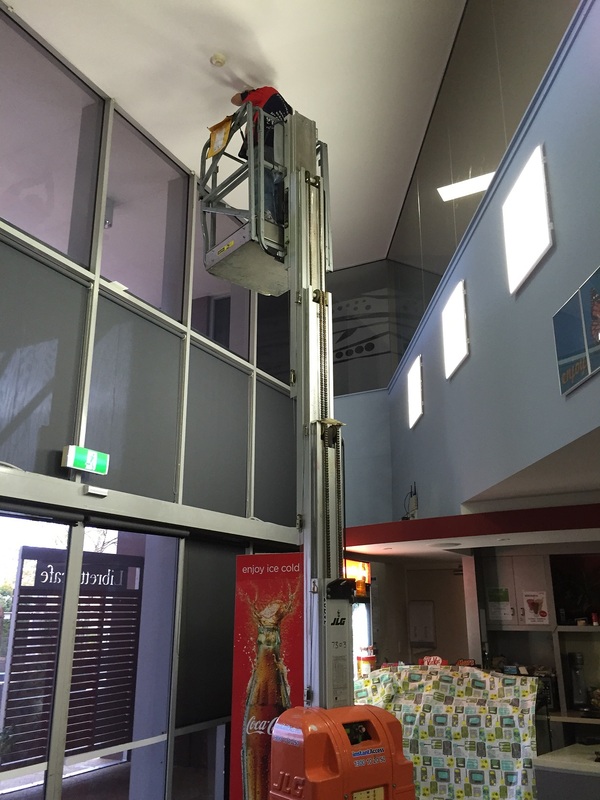 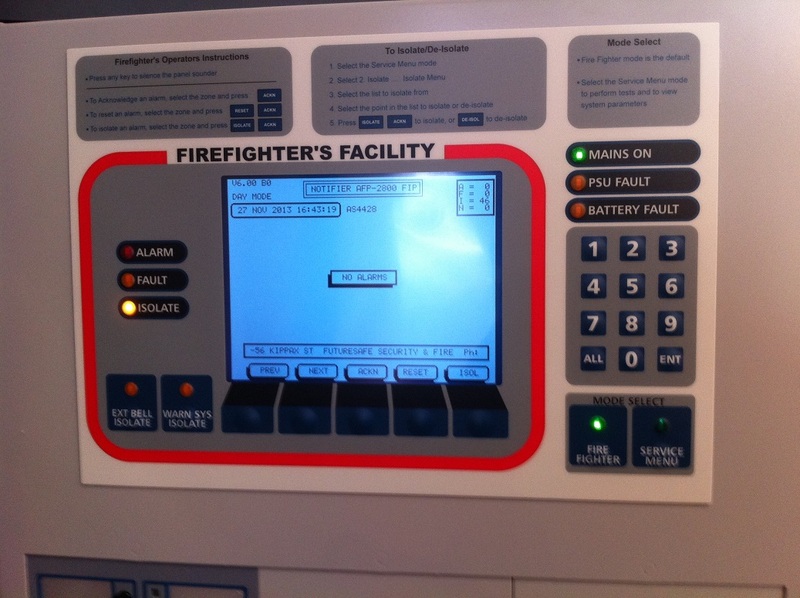 Upgrade of entire Fire Alarm System from conventional to addressable and AS1668 fan controls at FIP. 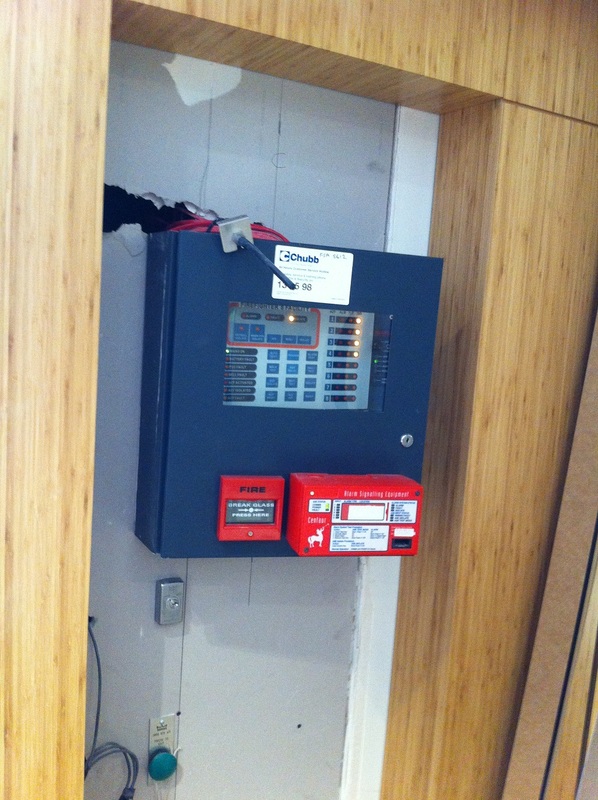 Lobby refit design required that the fire panel be moved from next to lift to new cupboard in front of foyer and replaced, there was allot of faults with the current installation and the plan to break the floors up into suites meant that it was prudent to install a new addressable system and change all devices in the building as the floors are upgraded one floor at a time as the building is still occupied. 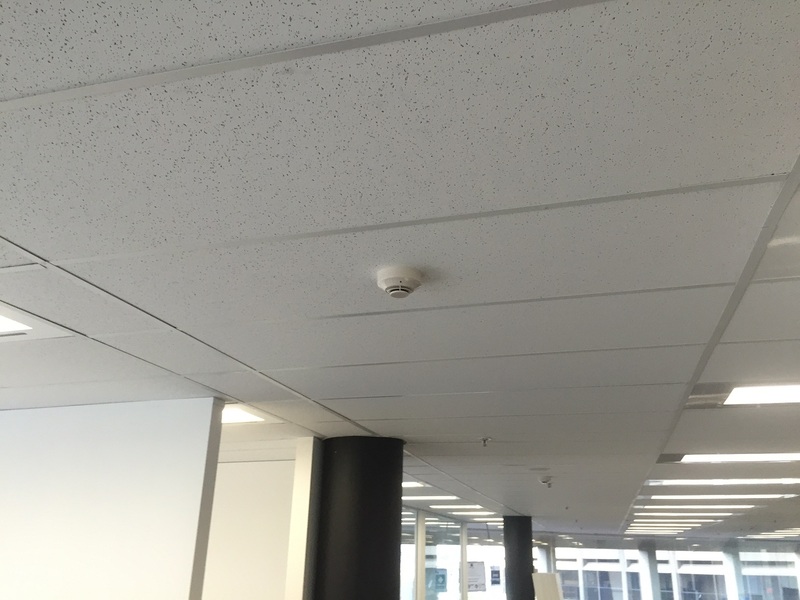 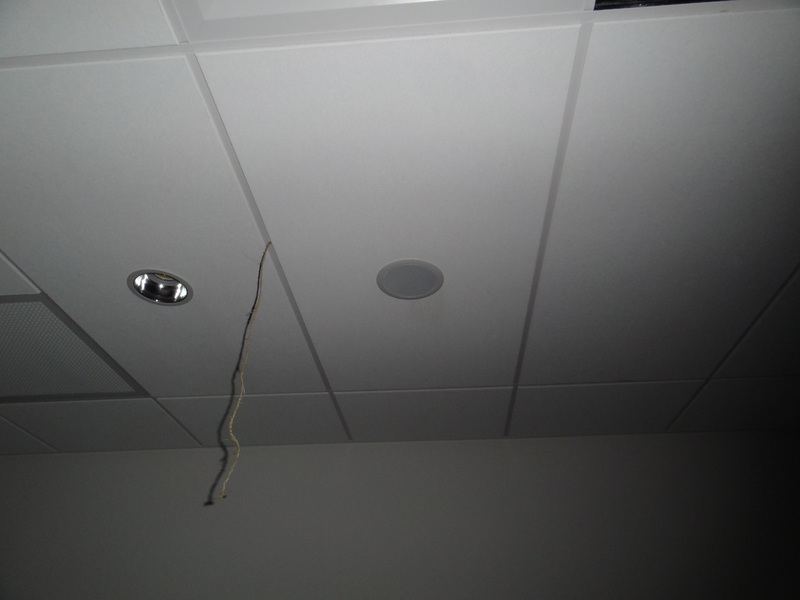 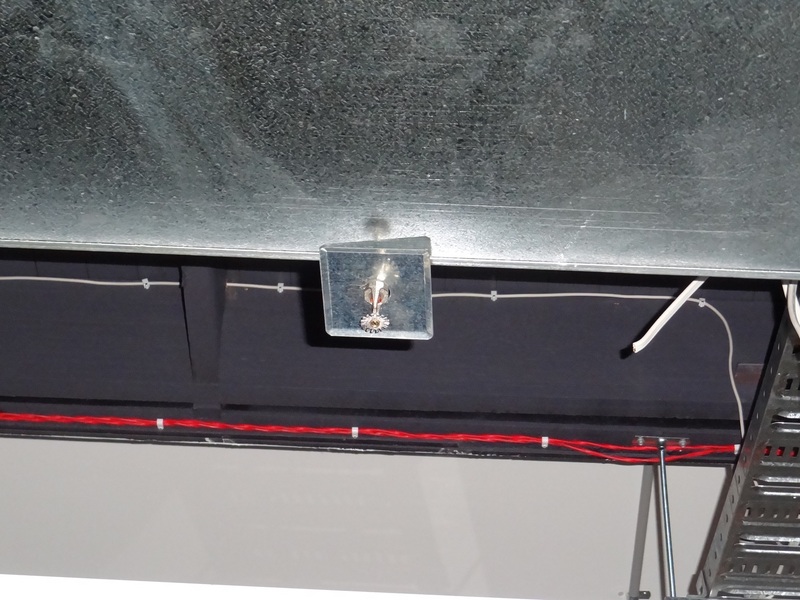 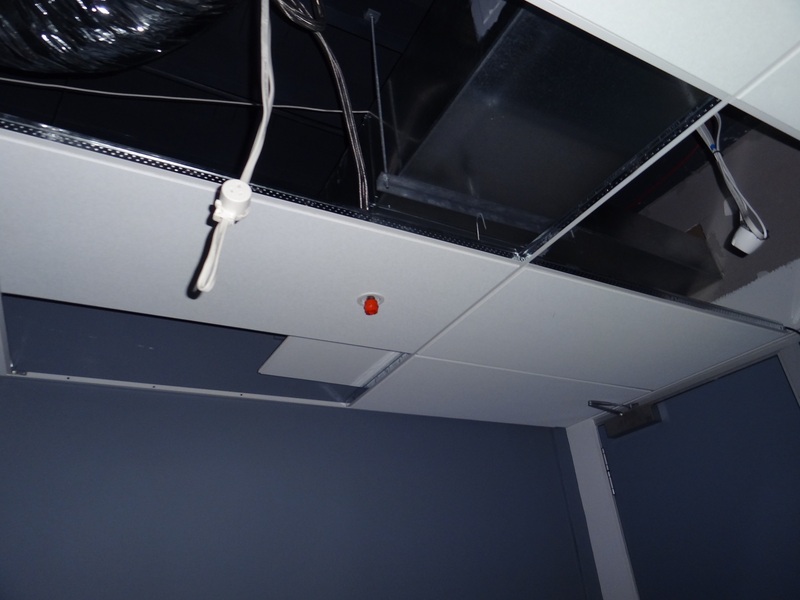 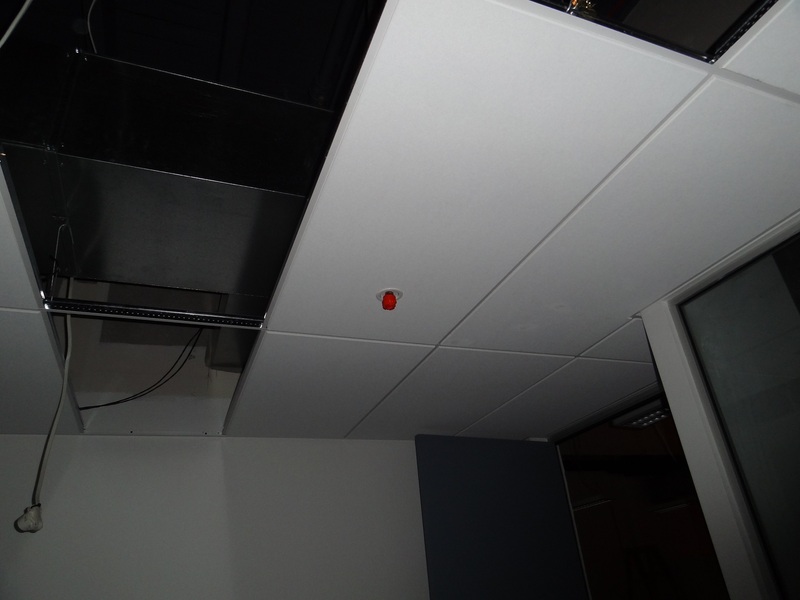 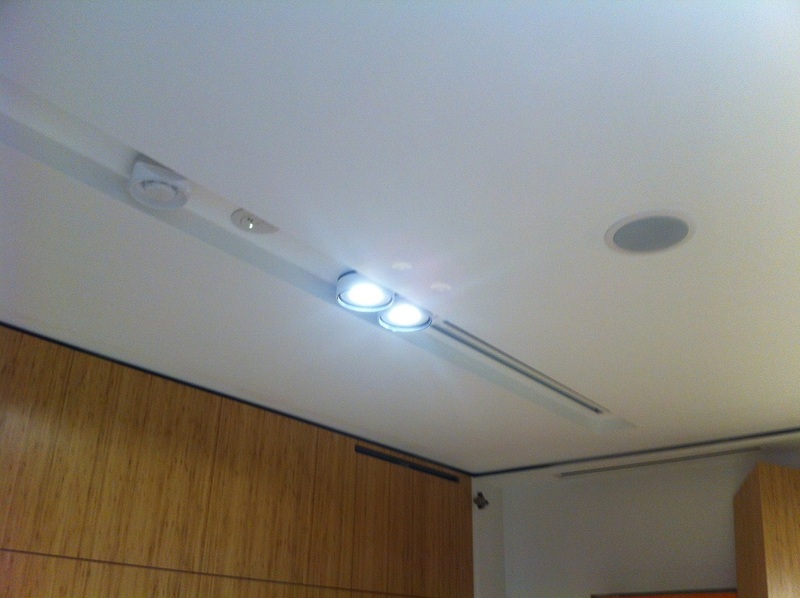 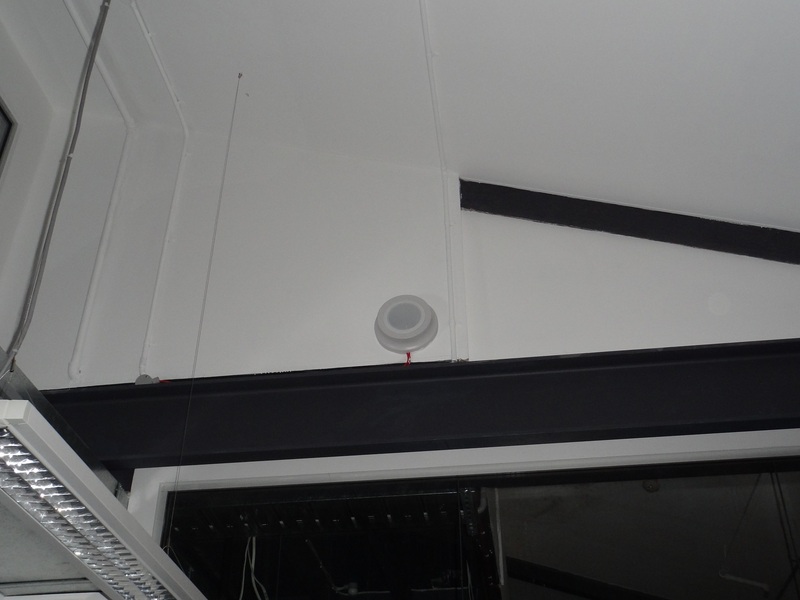 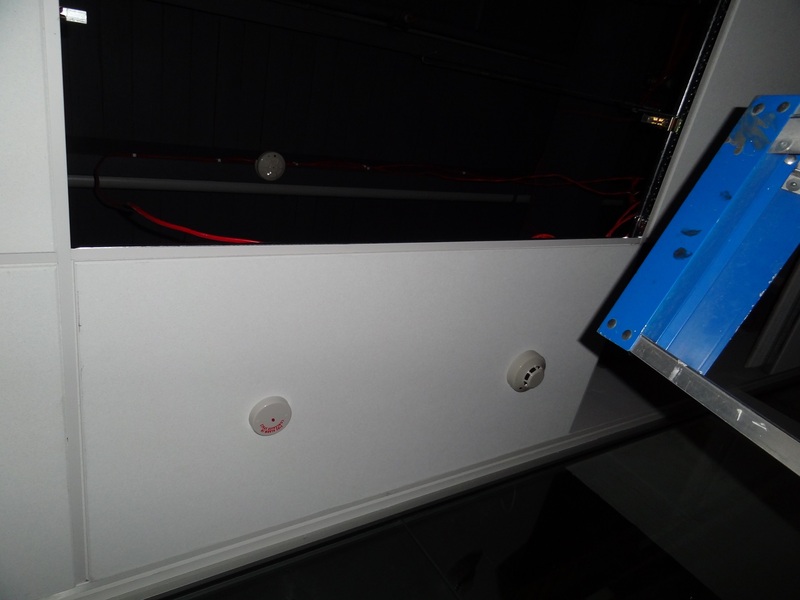 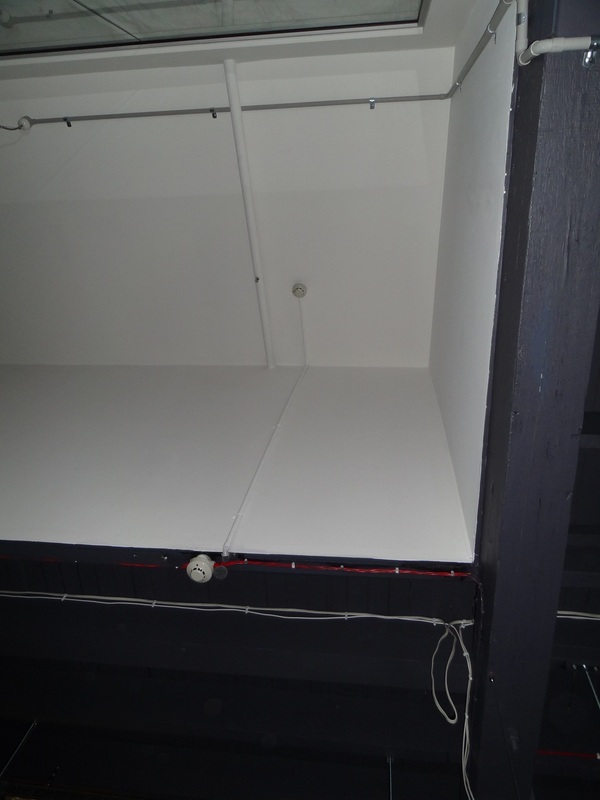 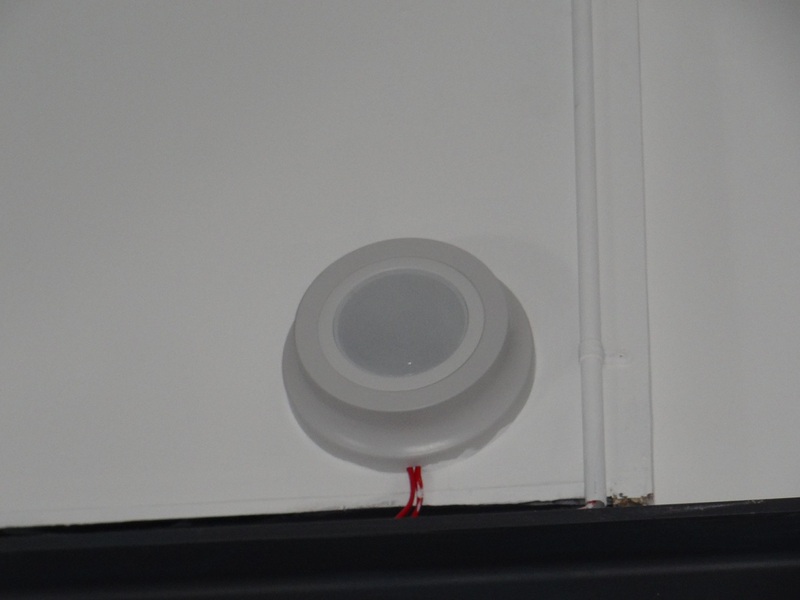 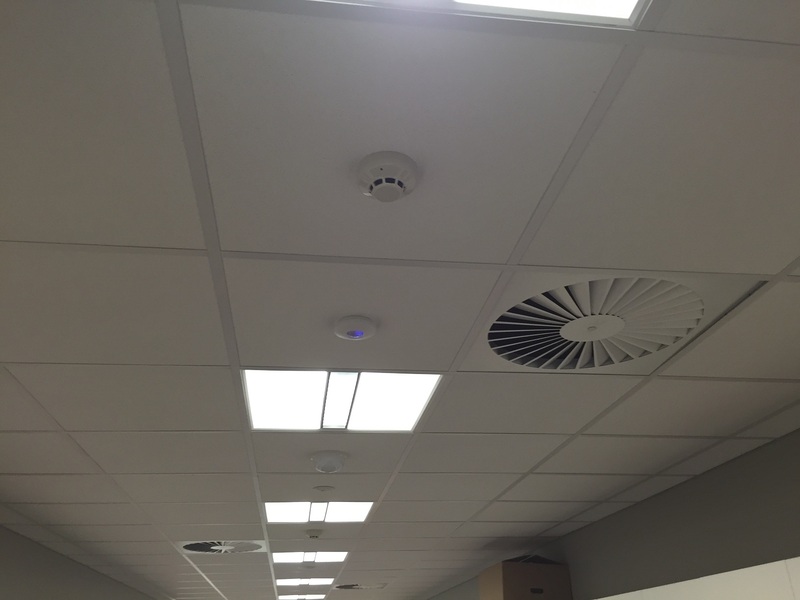 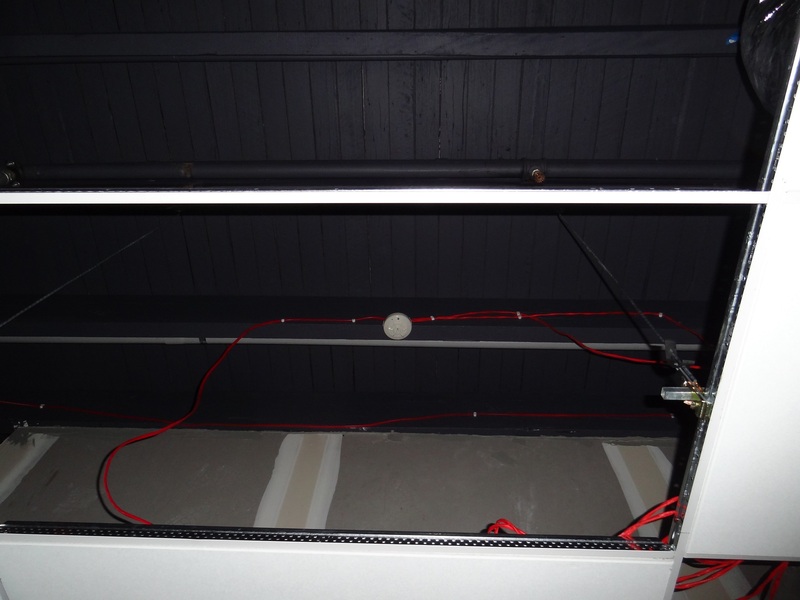 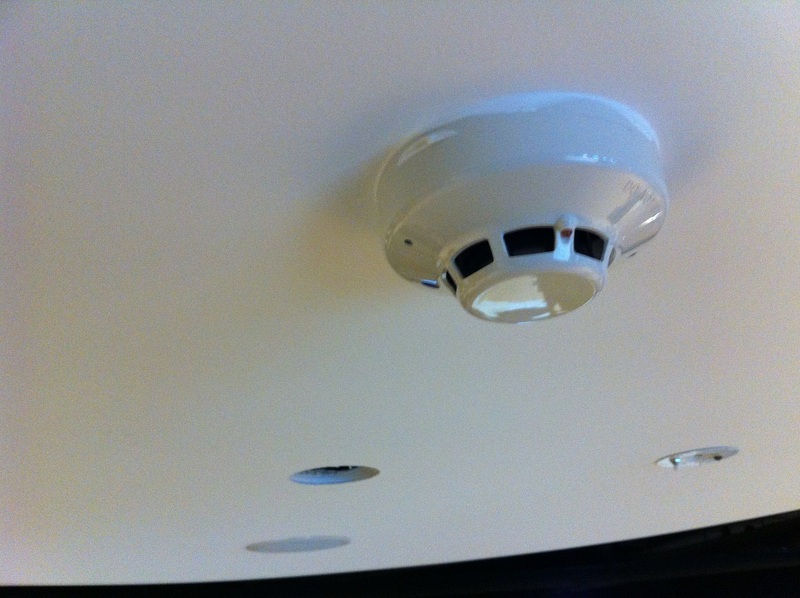 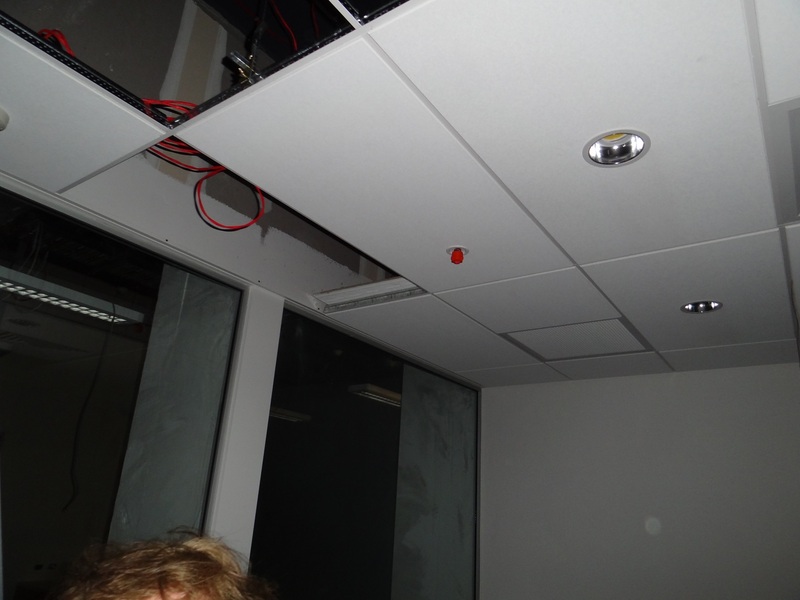 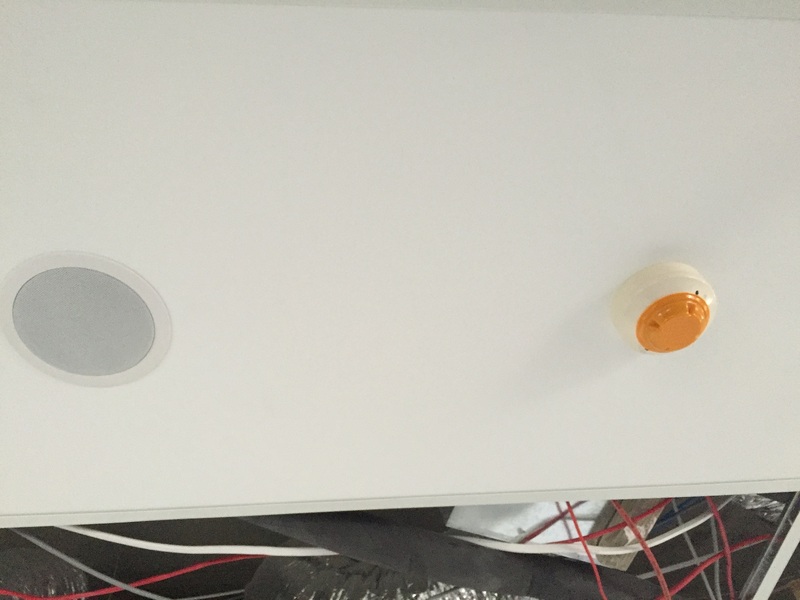 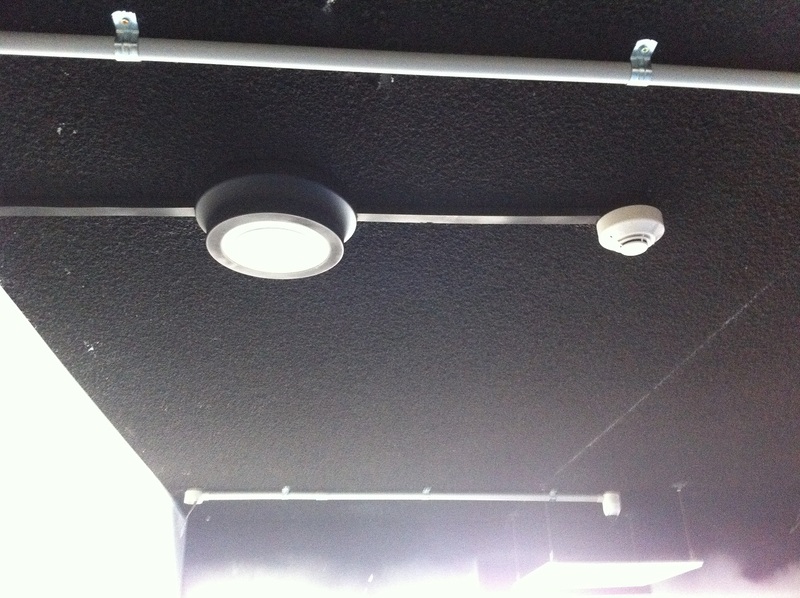 New Notifier 2800 FIP was fitted with addressable loop and conventional cards to run the occupied floors that have the old conventional detectors and as floors were reconfigured and refitted they were brought into the addressable loop with new addressable heads and Notifier SP100 speakers, much of the building has been done in a exposed ceiling style with heads and speakers fitted off the cable trays or in conduit painted black. 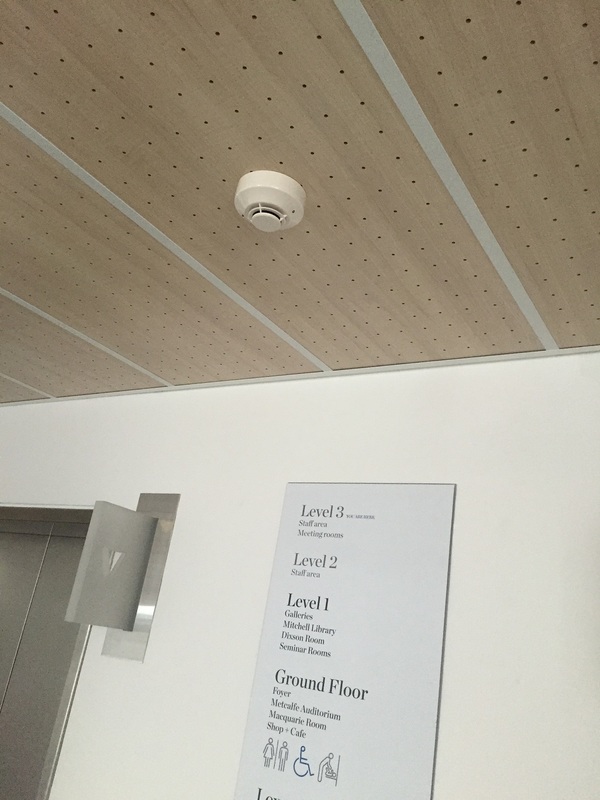 9 floors already completed. 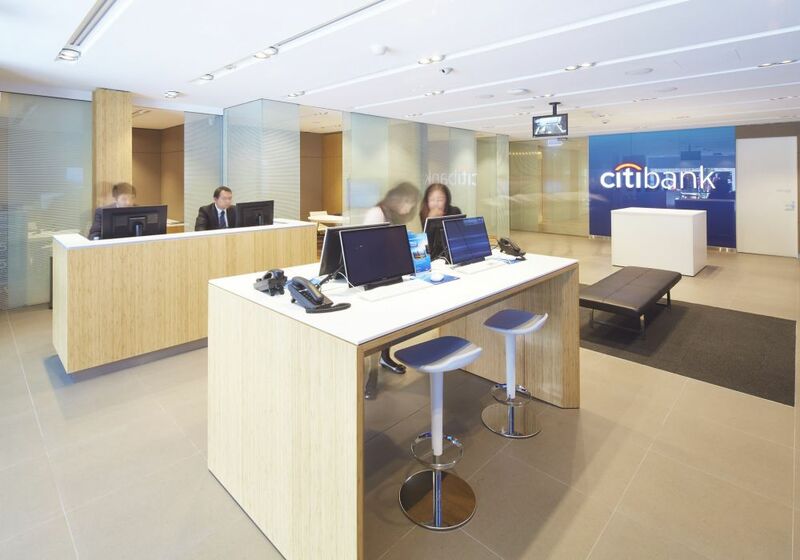 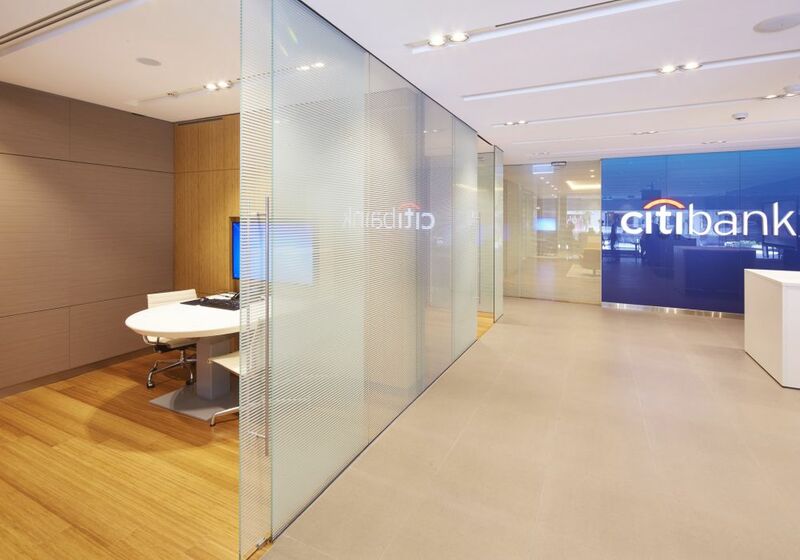 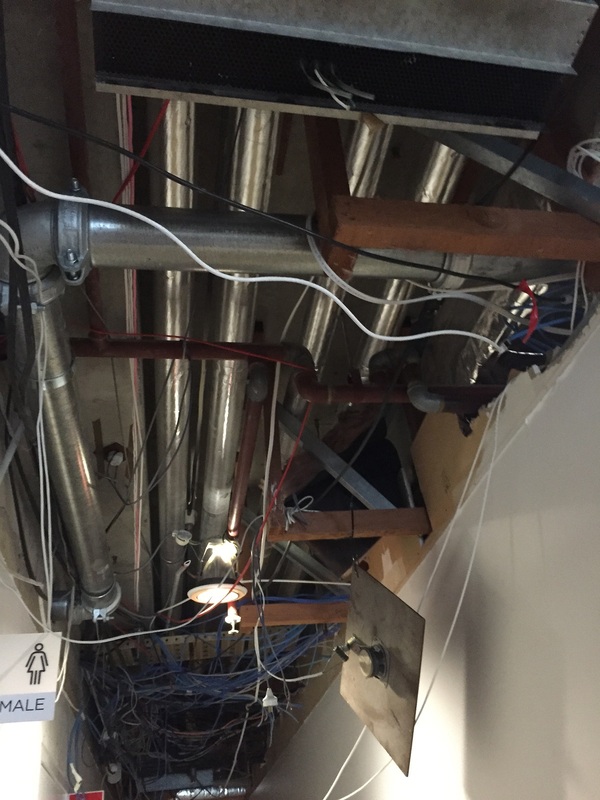 Works involved demolition of existing systems and installation of new while the branch was still trading, job was timed over 3 stages to allow the branch to continue trading and continue with back of house operations during the refit. 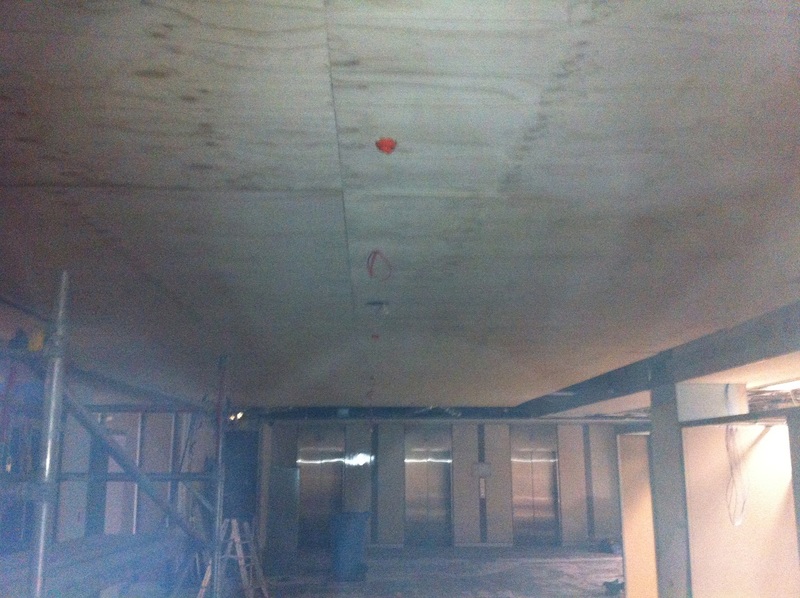 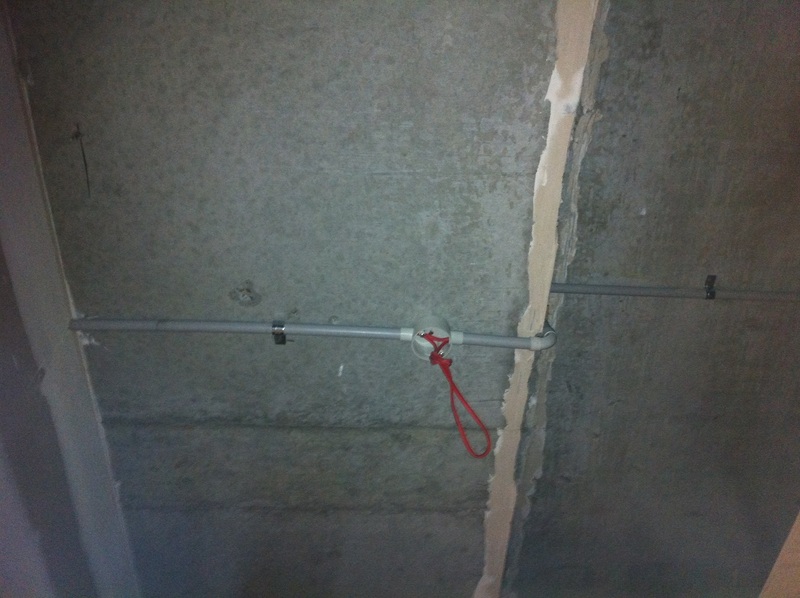 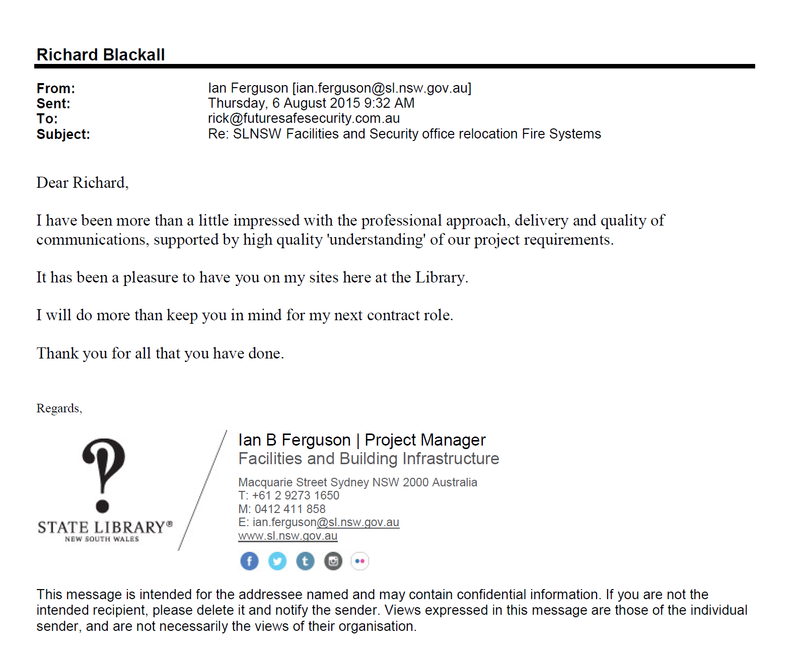 This site had several challenges including a request from a bank that occupied the lower floors that there be no faults on the FIP and EWIS during the works, a extra challenge as the Chubb NFP uses proprietary software however the bank and building manager were delighted that we were able to carry out works with no faults left on the FIP or EWIS during the construction period. 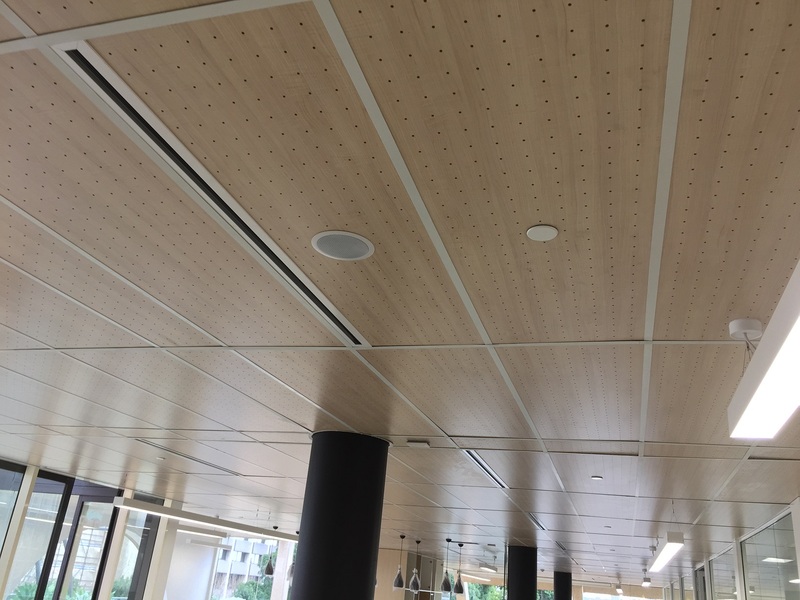 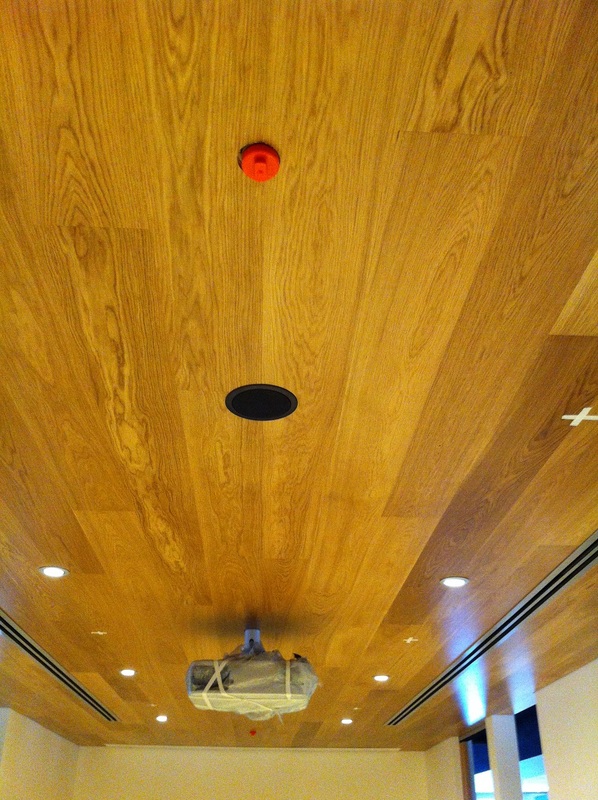 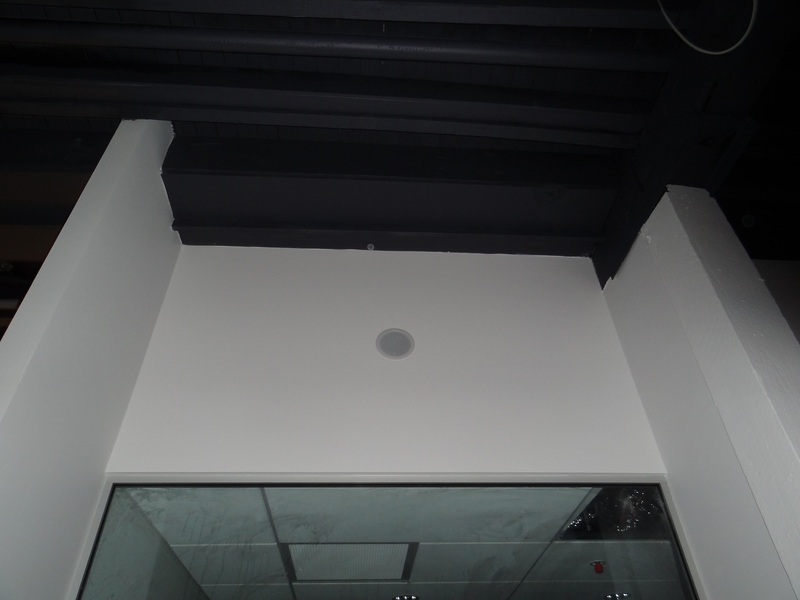 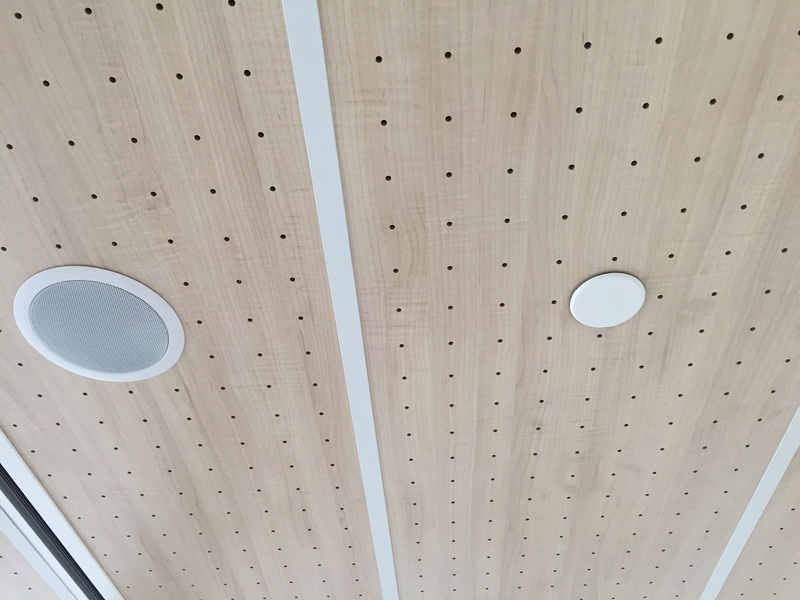 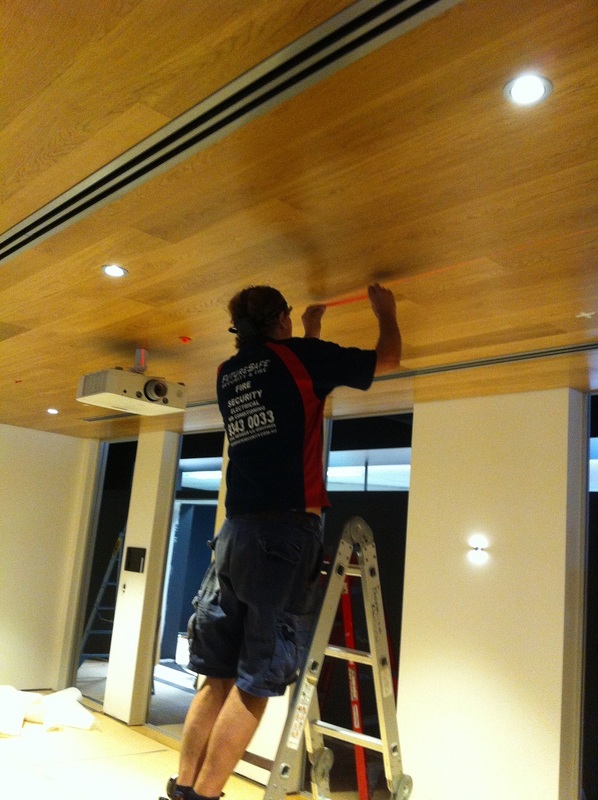 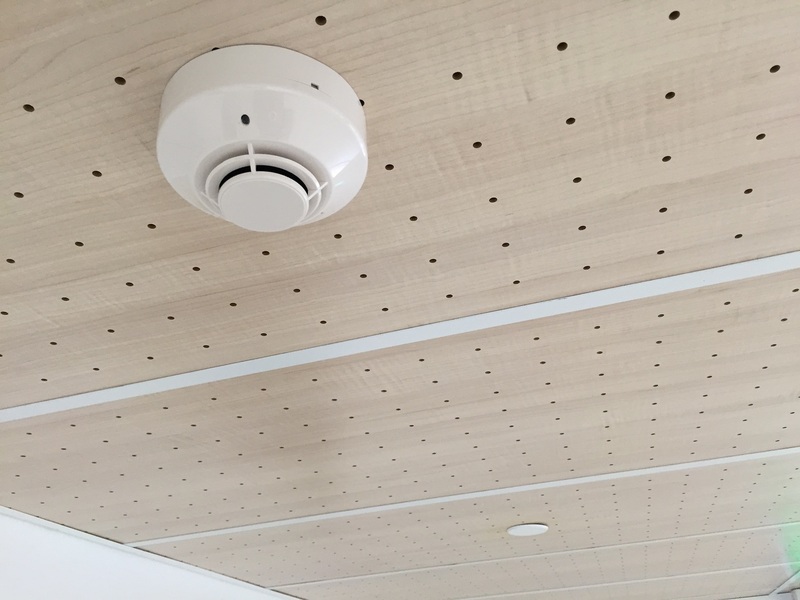 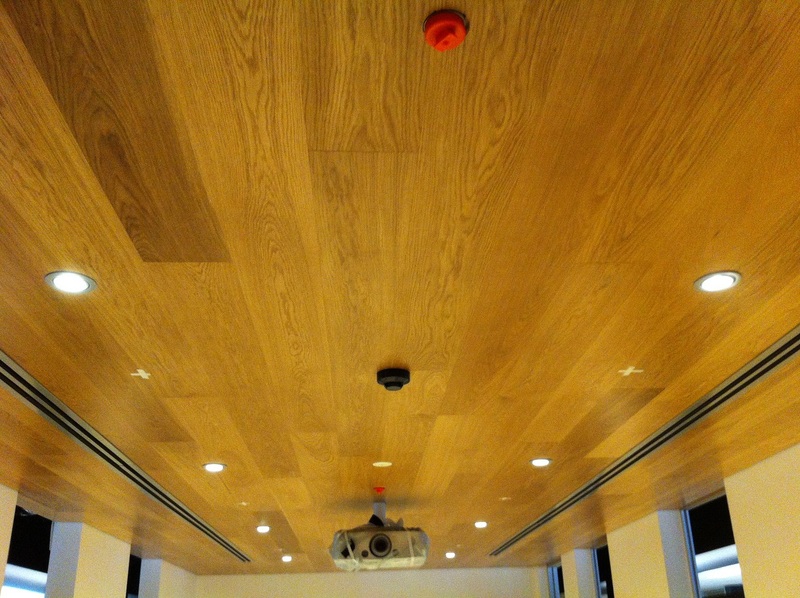 This floor also had a mixture of ceiling finishes including exposed, grid, set and a feature ceiling with ply and laminated panels, all came up well and the black detectors and speakers disapeared into the exposed areas and looked great on the timber ceiling. 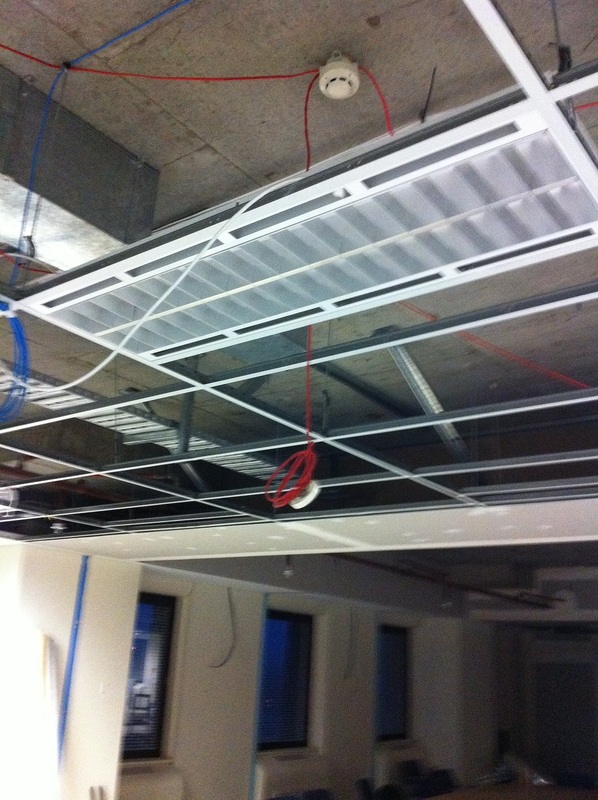 Building had a base building fitout with no allowance made for partitions, rectification works carried out over 14 floors to bring building into compliance with AS1670 and BCA E2.2A, various other repairs including maintenance to EWIS and WIPs, over 100 addressable smoke detectors fitted throughout tenancies, in common areas and plant room. 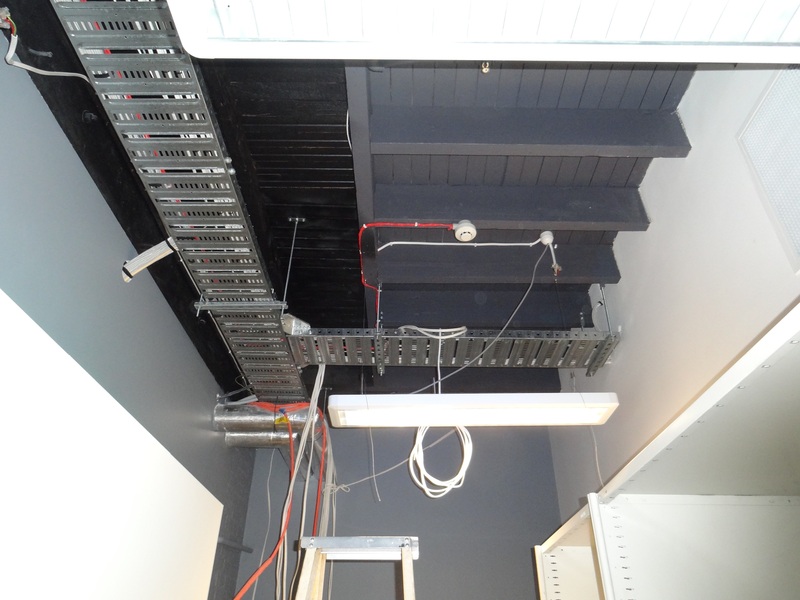 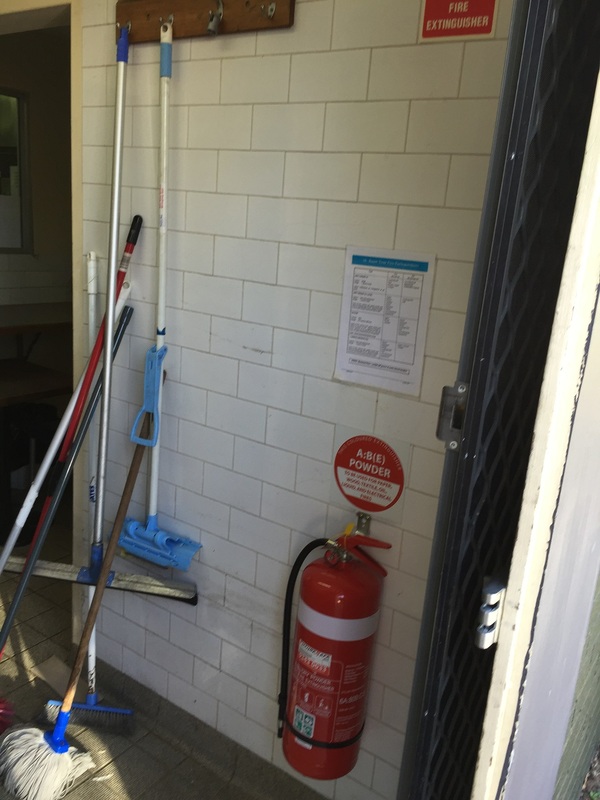 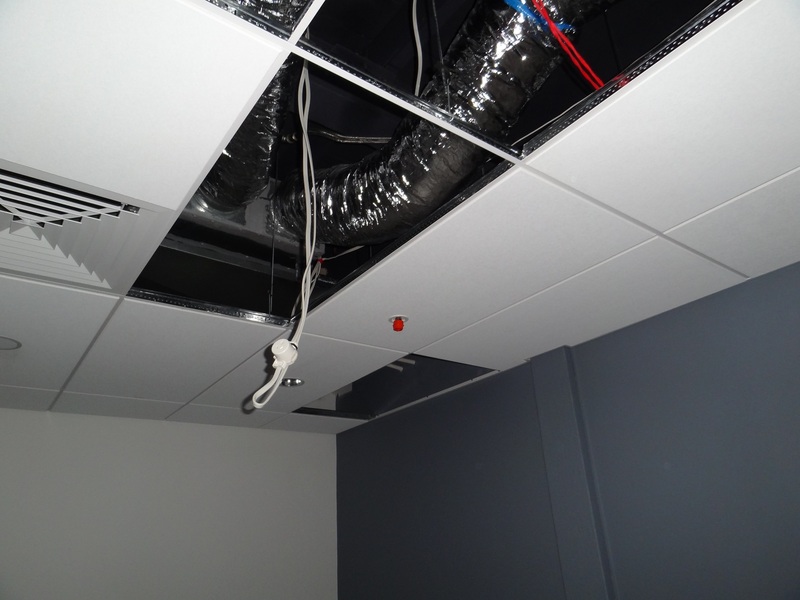 Much of the rectification works were carried out after hours and involved using smaller EWPs as the only access was through the disabled ramp, these works were to repair dry systems that had been incorrectly installed by previous contractors. 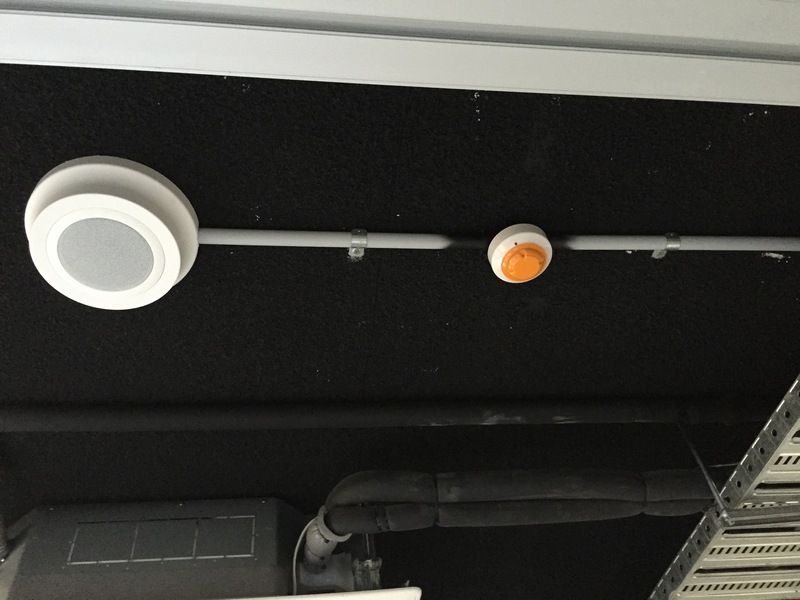 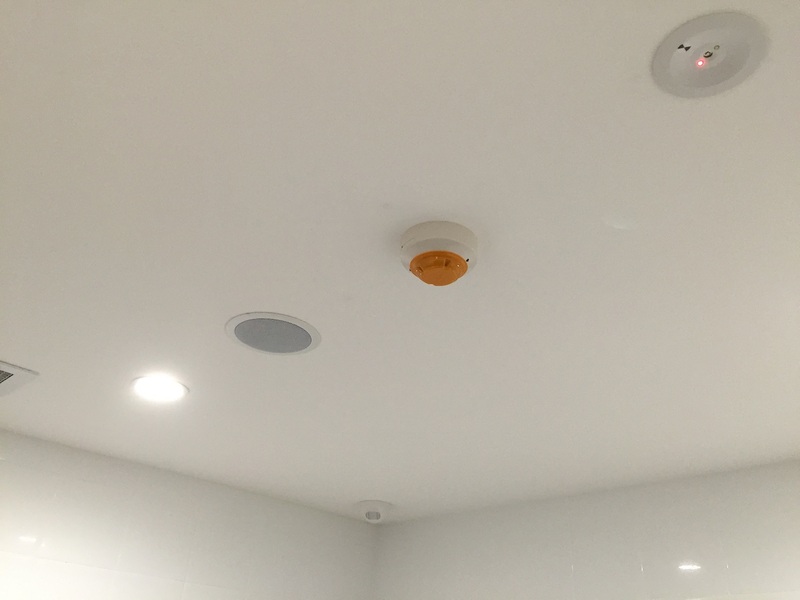 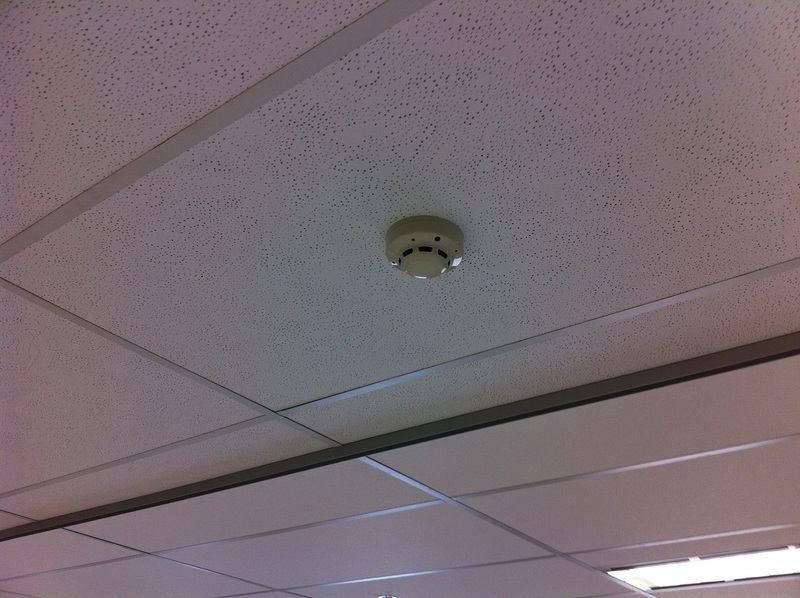 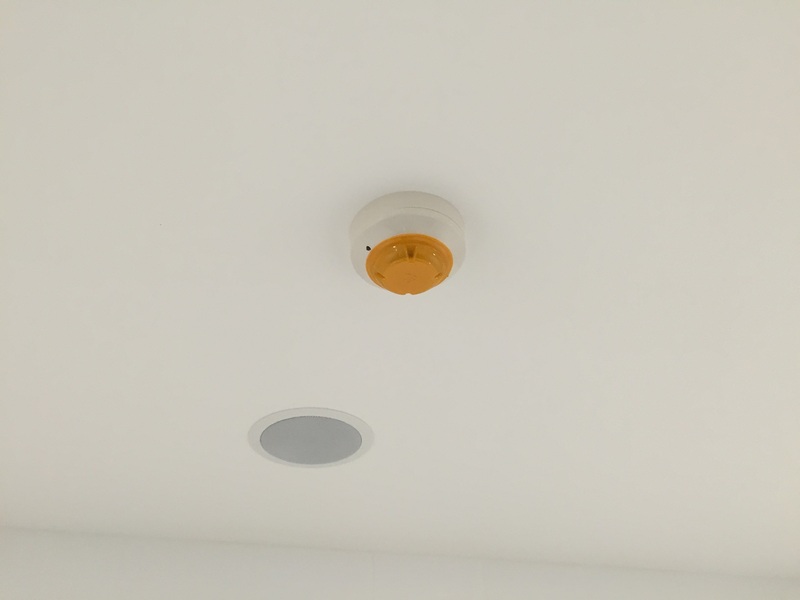 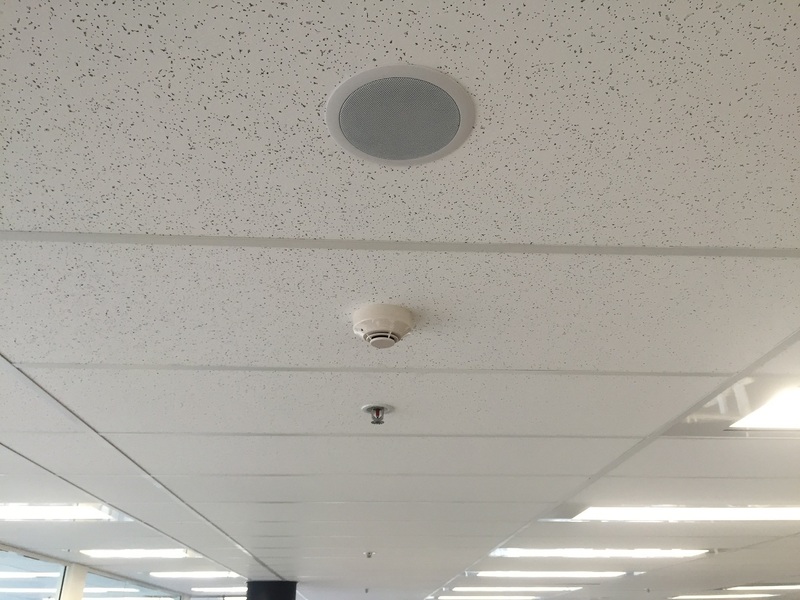 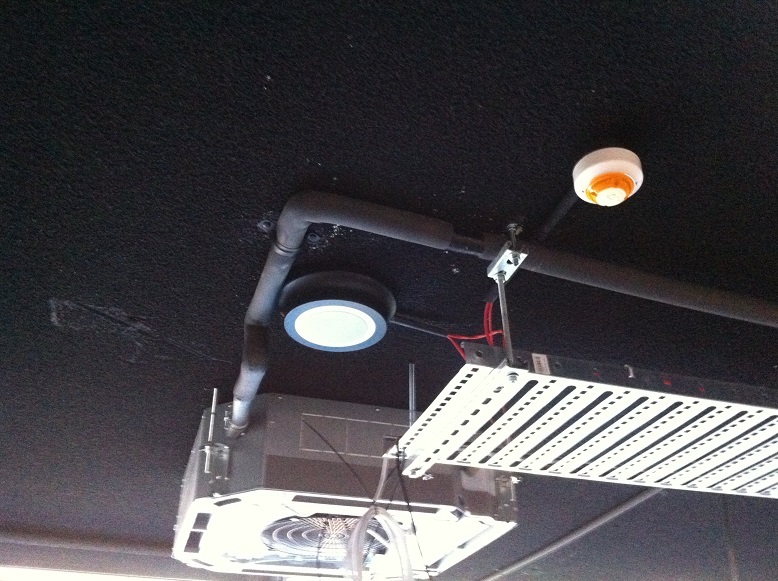 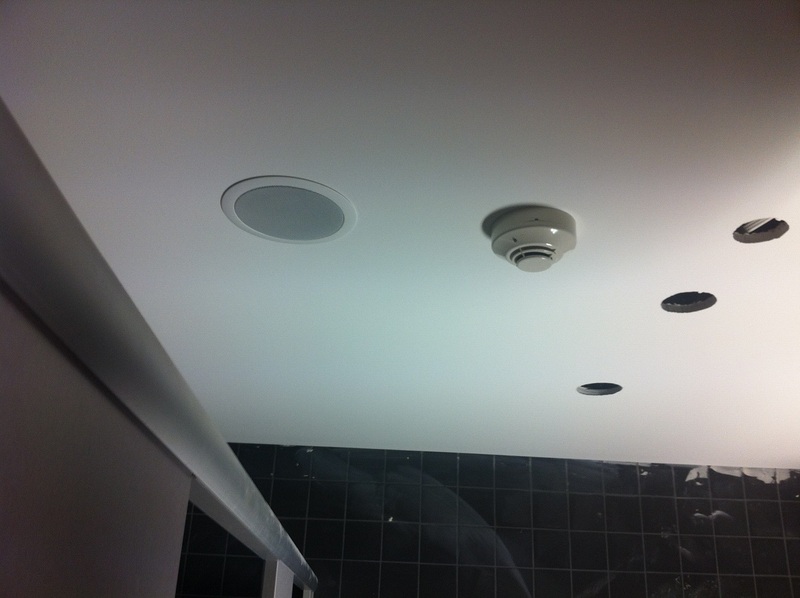 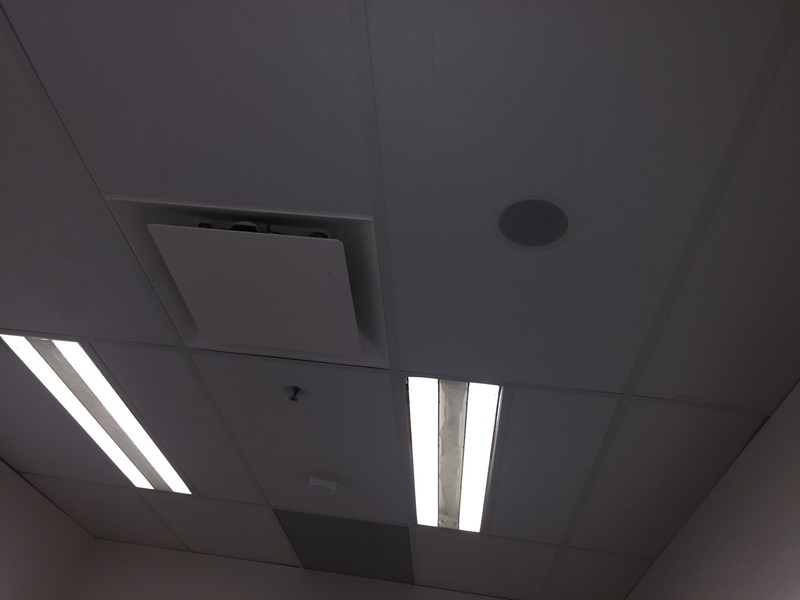 We also demolished and refitted new smoke and heat detectors as well as EWIS speakers in 3 sets of new bathrooms throughout the Library. 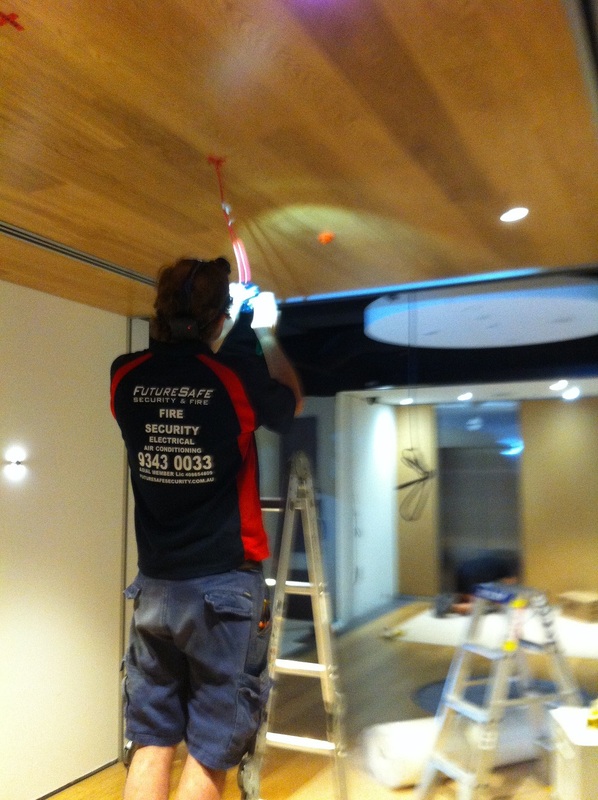 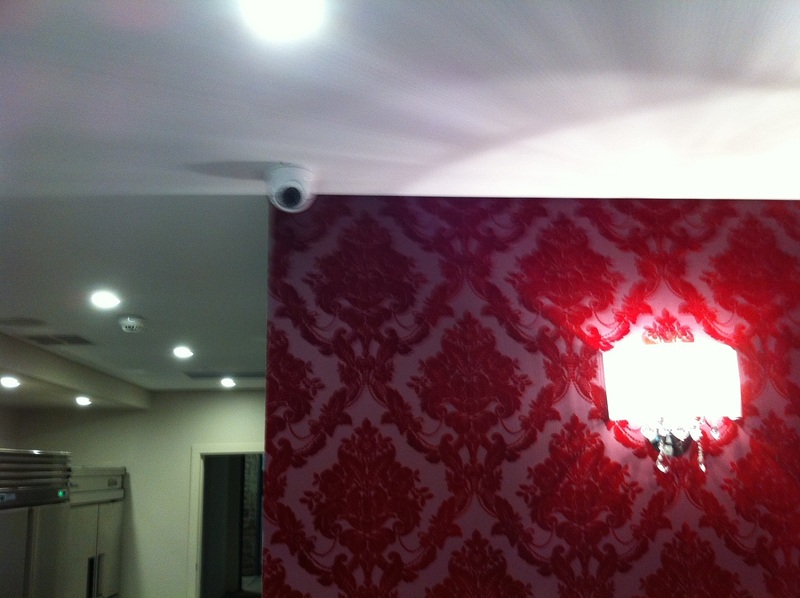 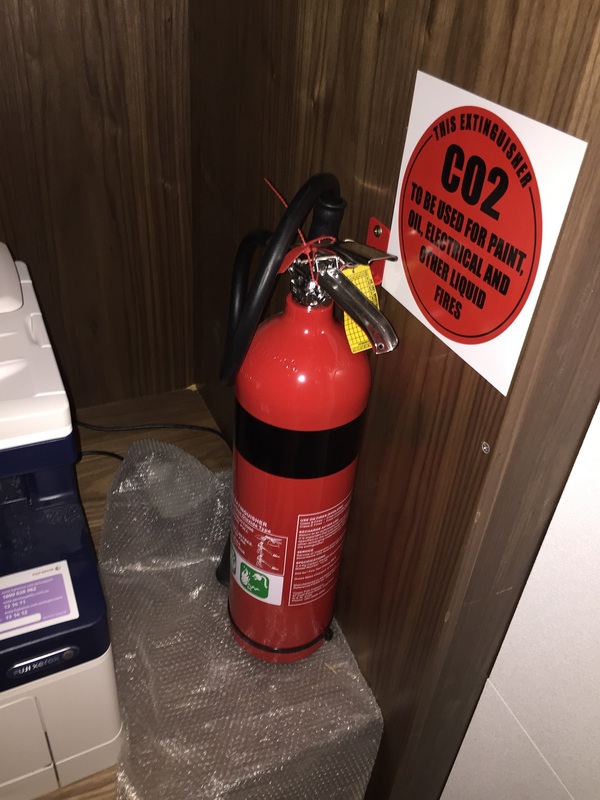 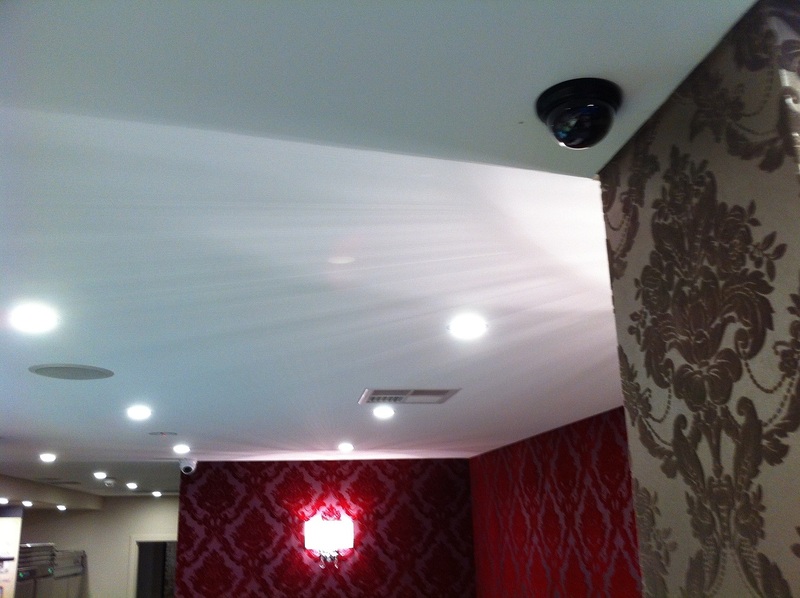 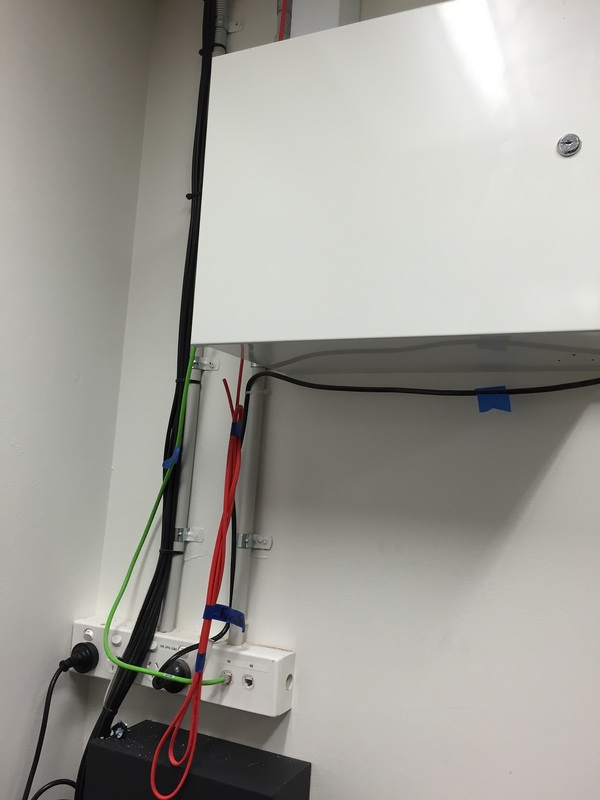 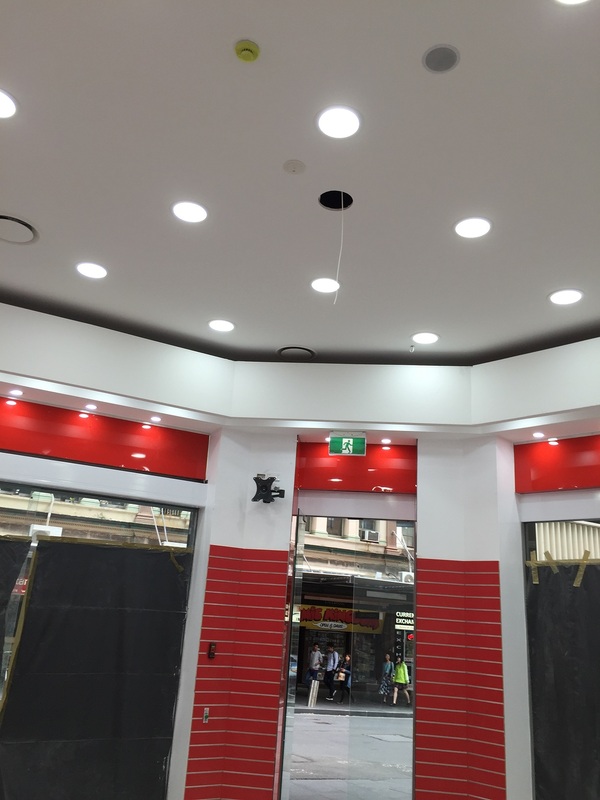 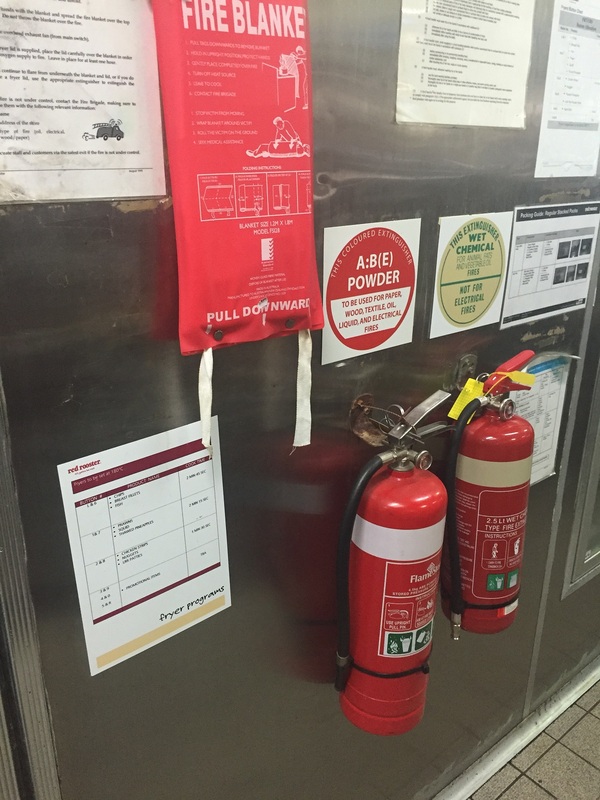 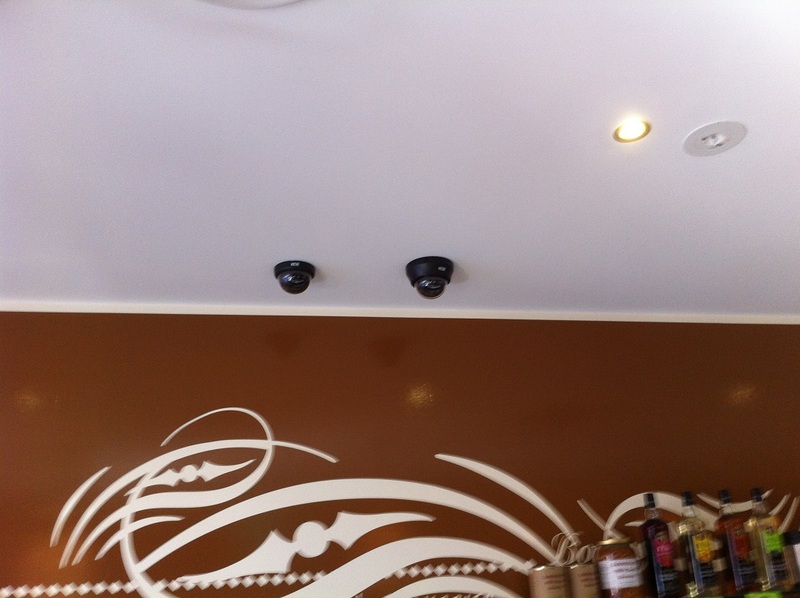 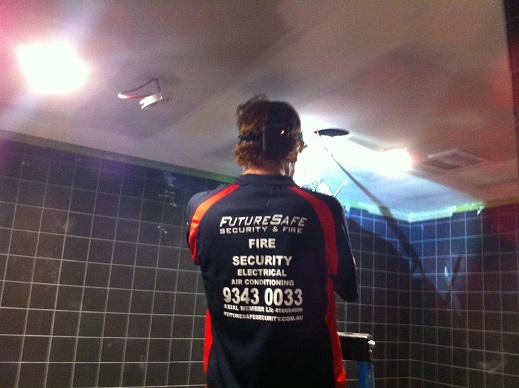 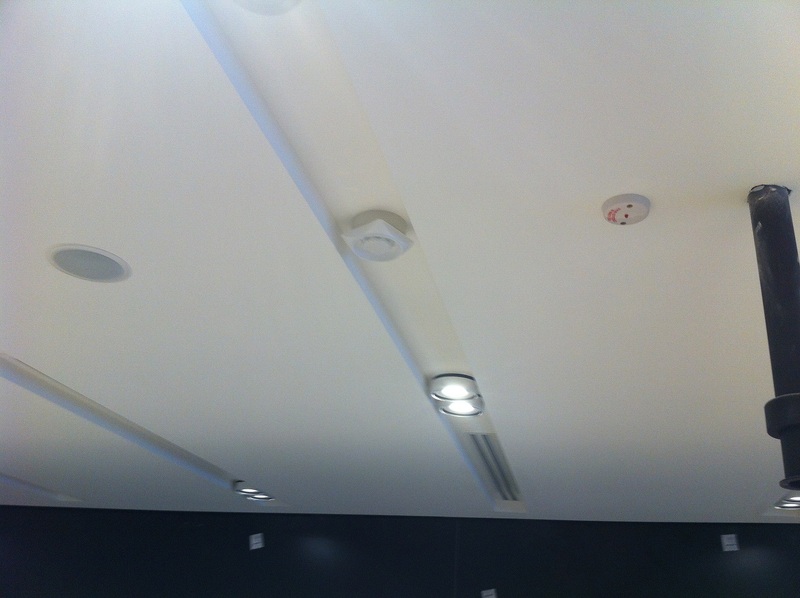 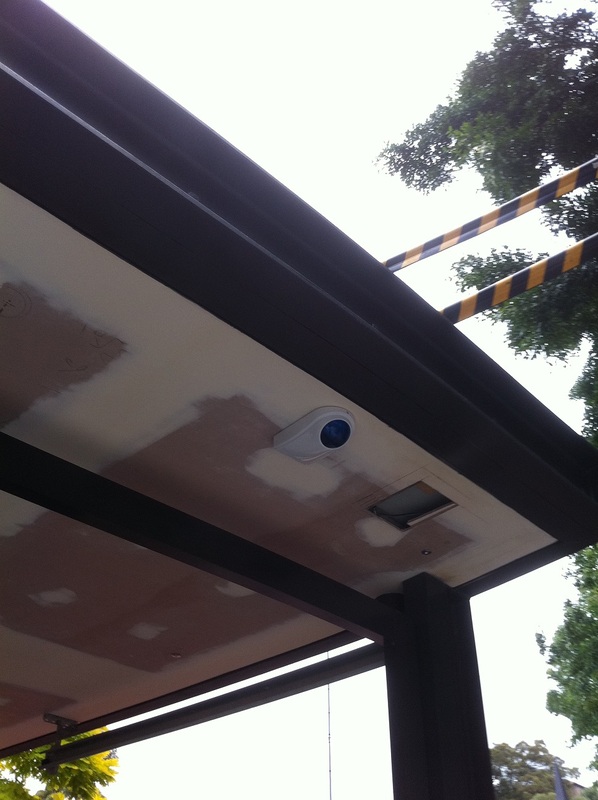 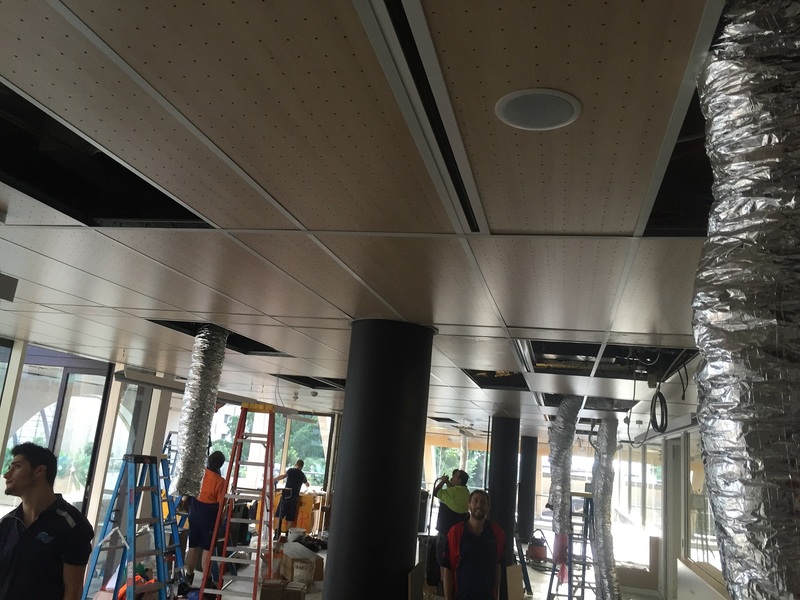 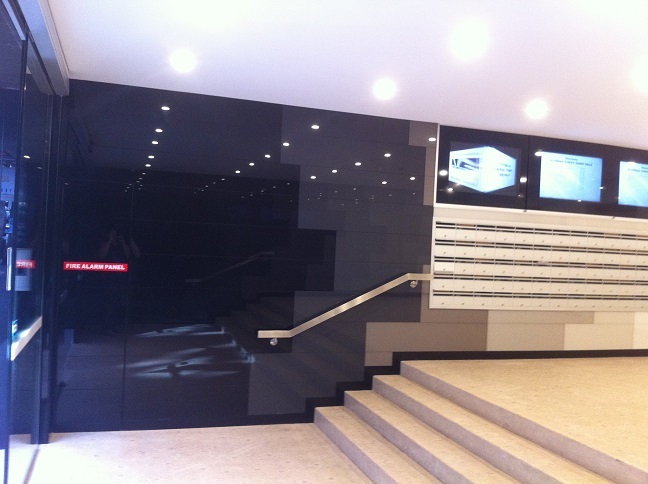 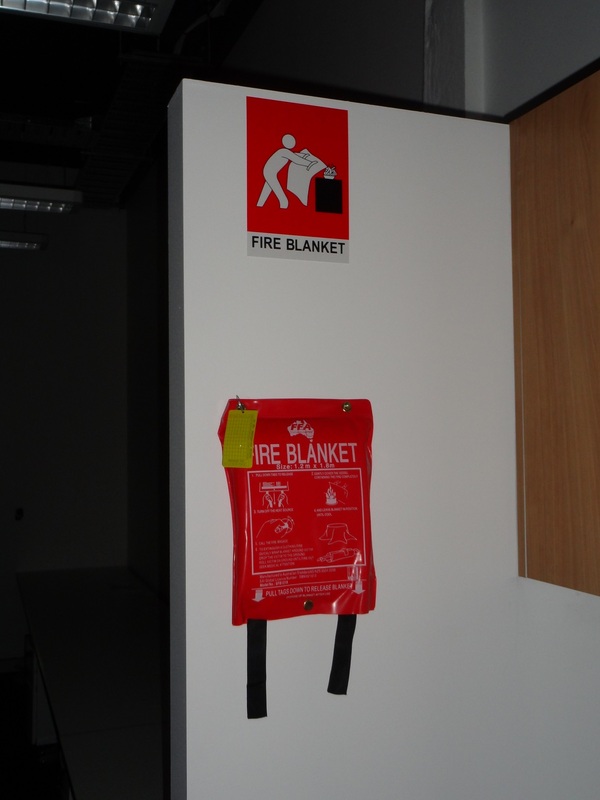 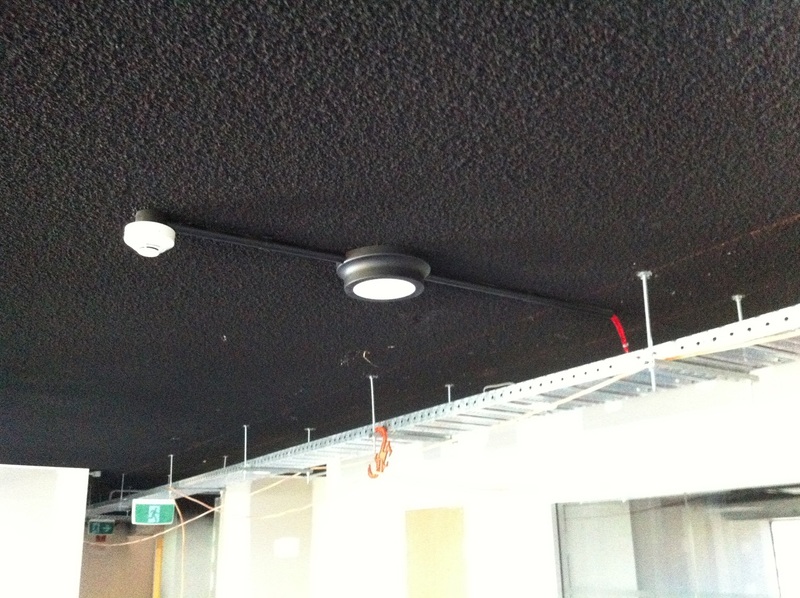 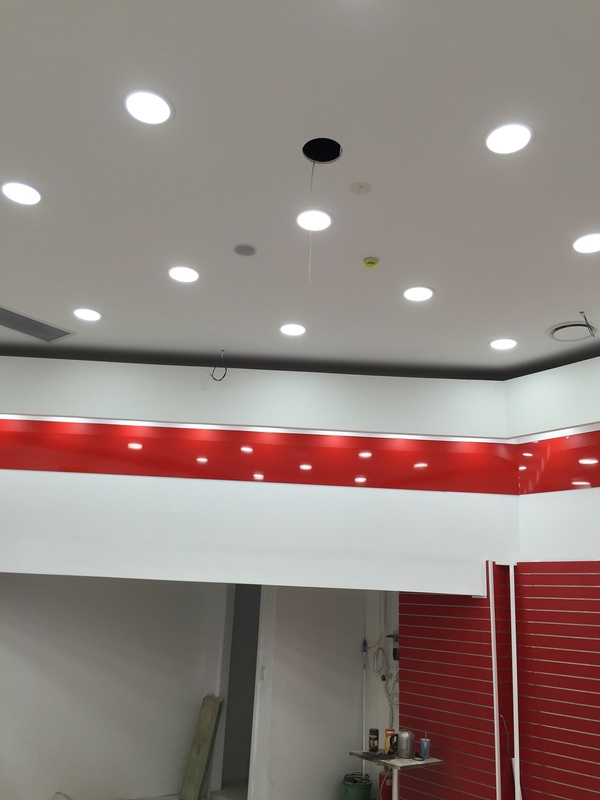 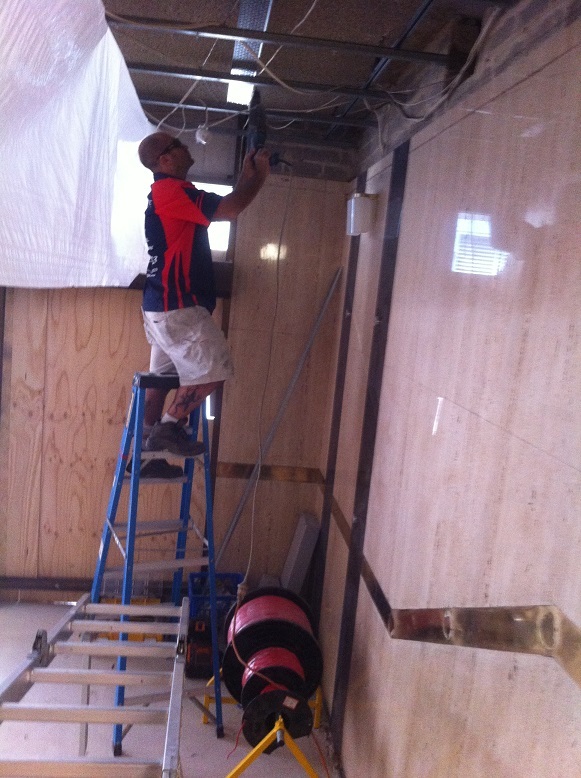 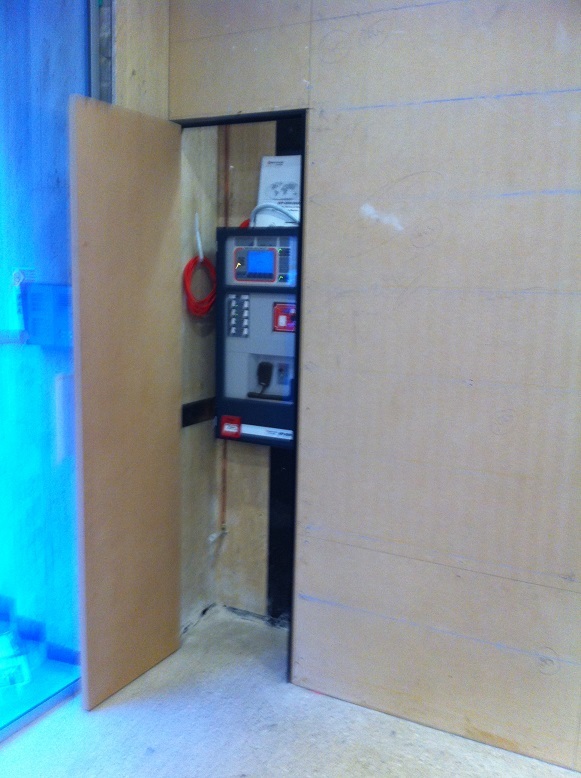 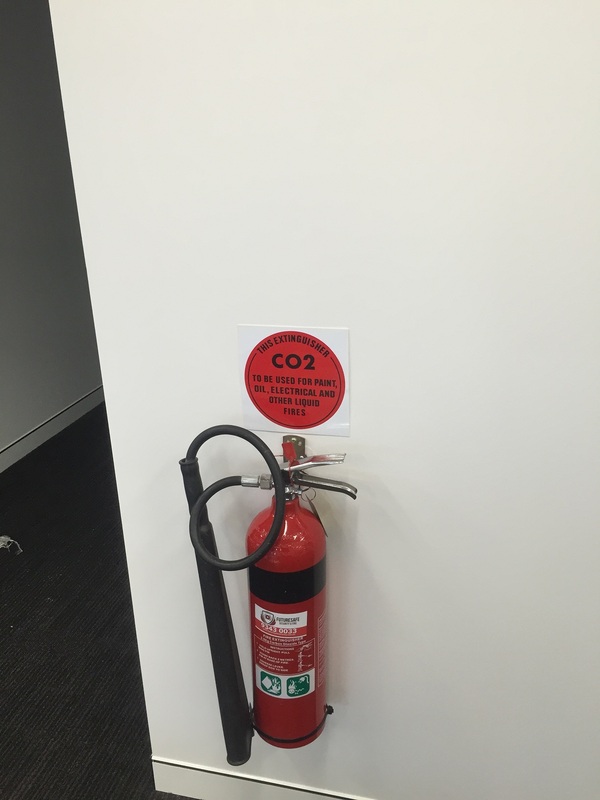 Sydney CBD Convenience store – Shop Fit Out – Brooks Fire Tracker FIP. 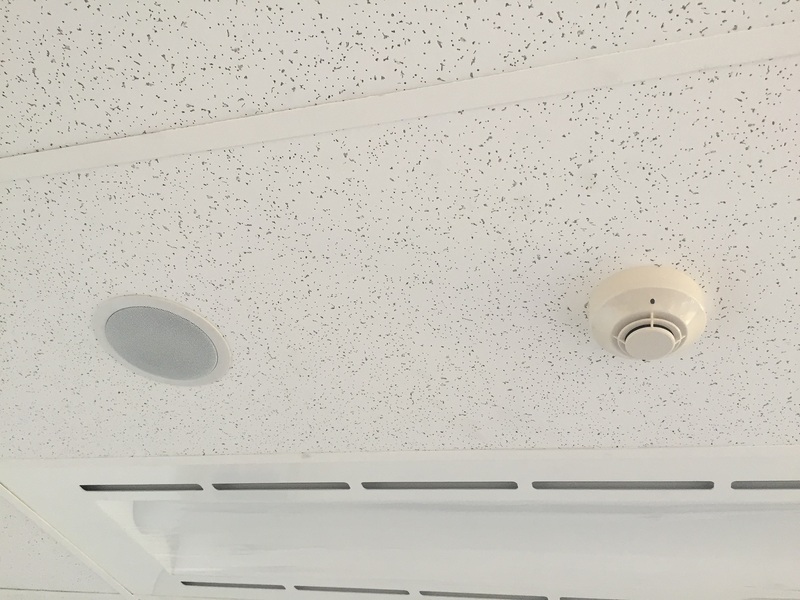 Removal of smoke detectors and BOWS speakers prior to demo and refit new heads in new set ceiling with concealed space head also. 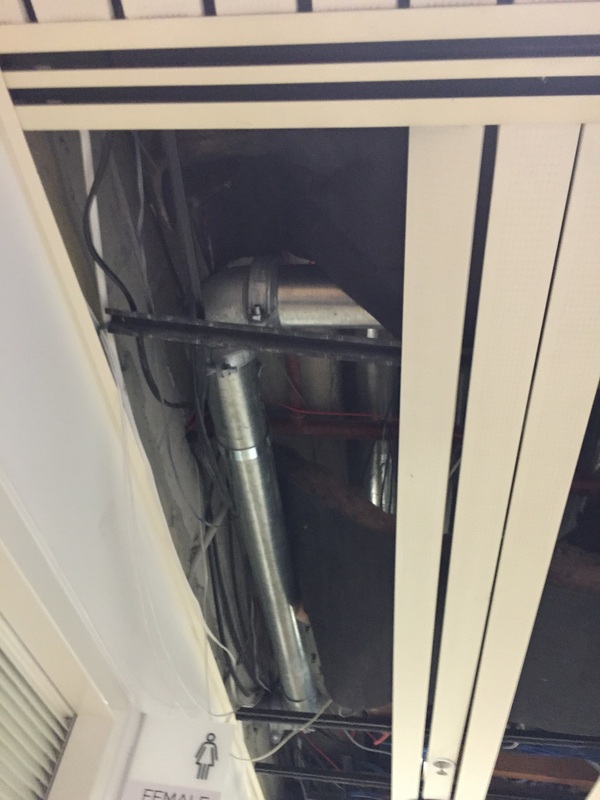 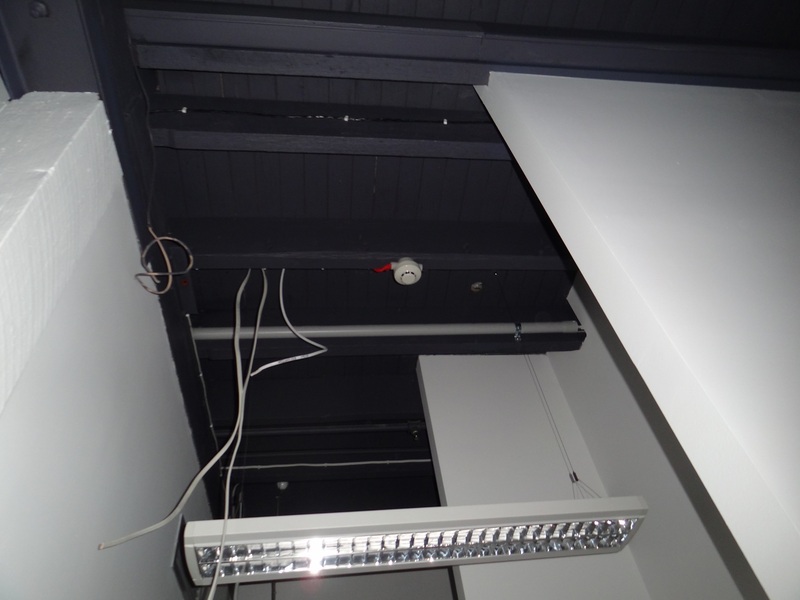 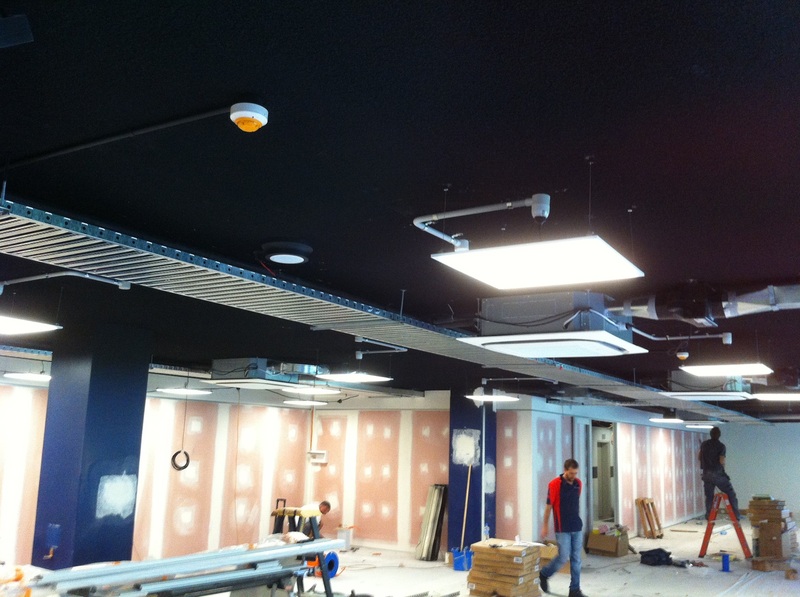 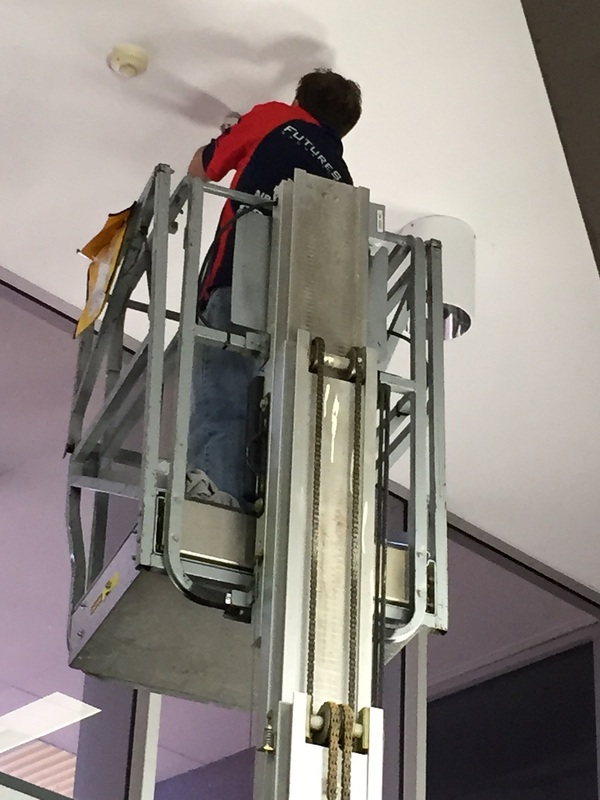 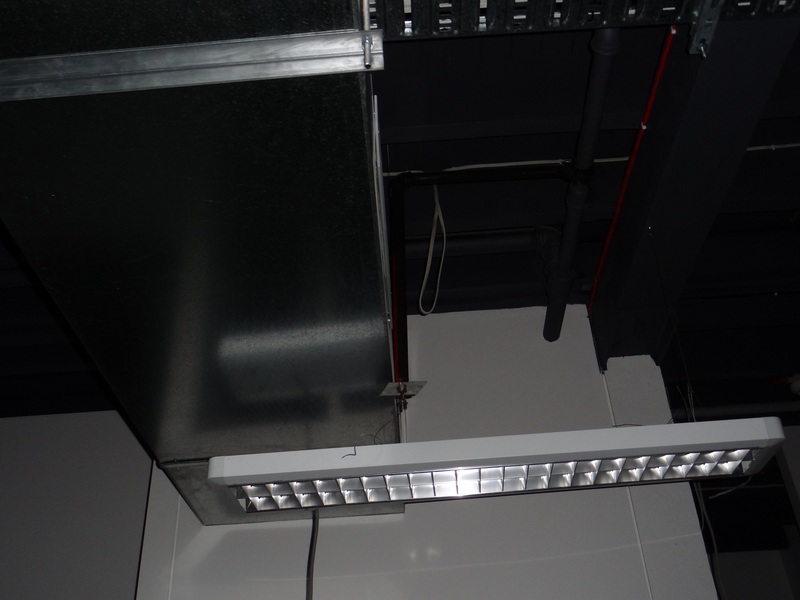 Removal and replacement of all duct probes carried out along side mechanical contractor replacing fan coil units, fit outs of dry fire systems for various shops including Harvey Norman, King Furniture and Fantastic Furniture. 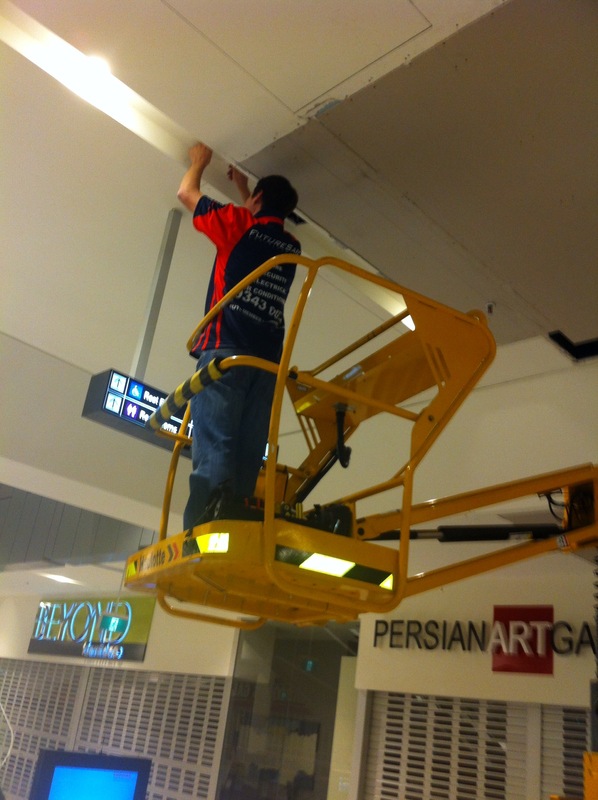 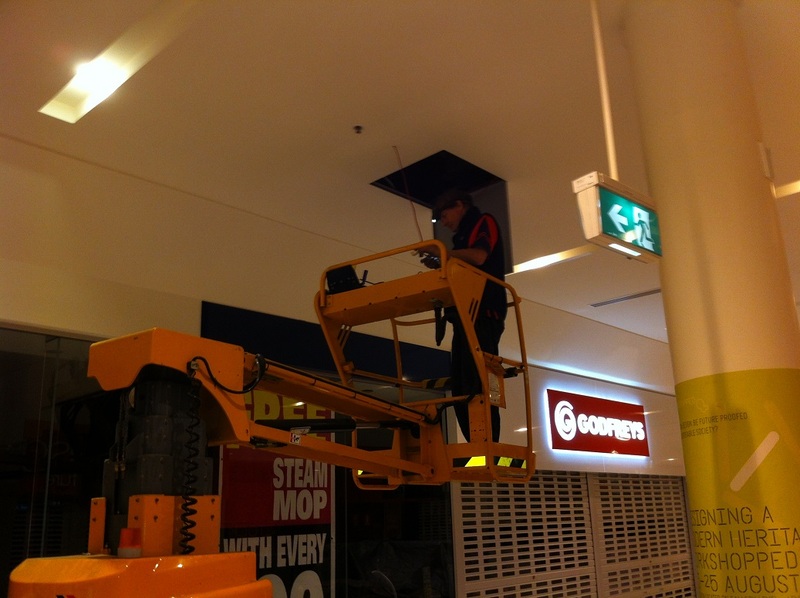 All works carried out after hours. 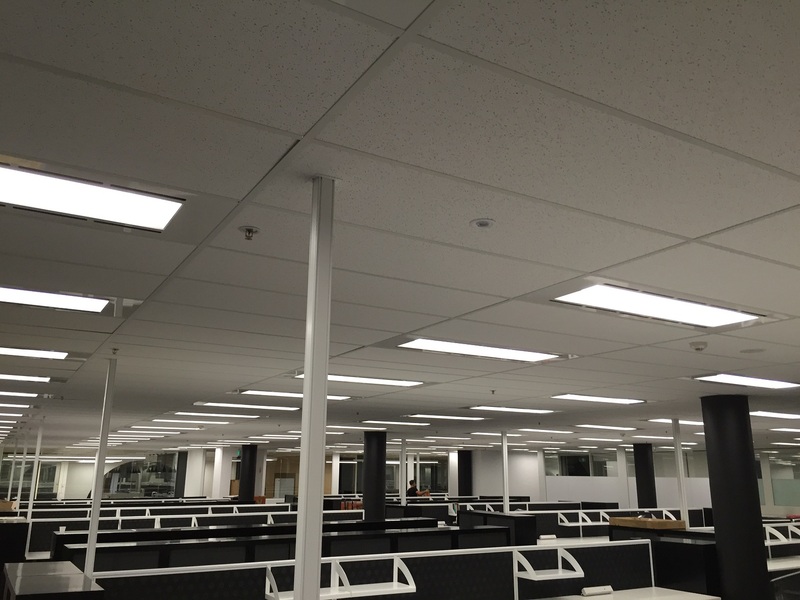 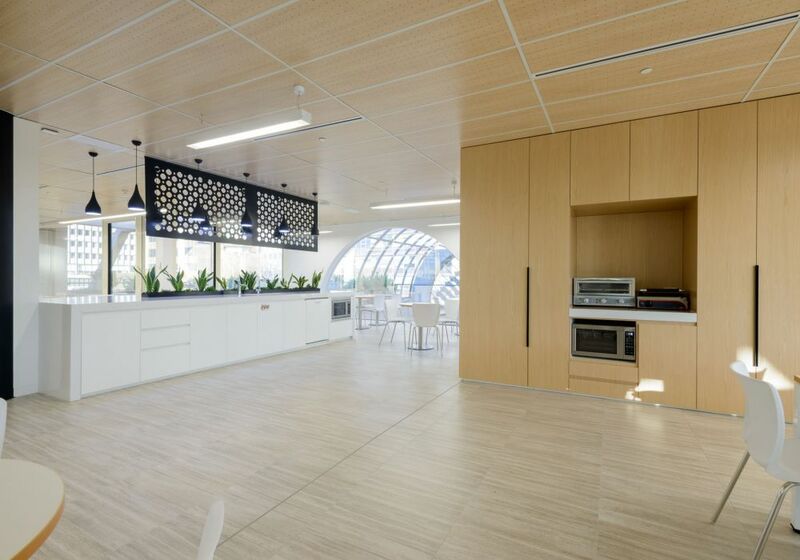 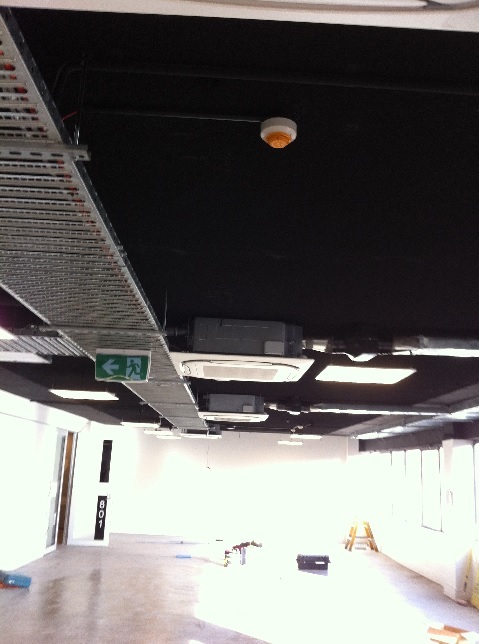 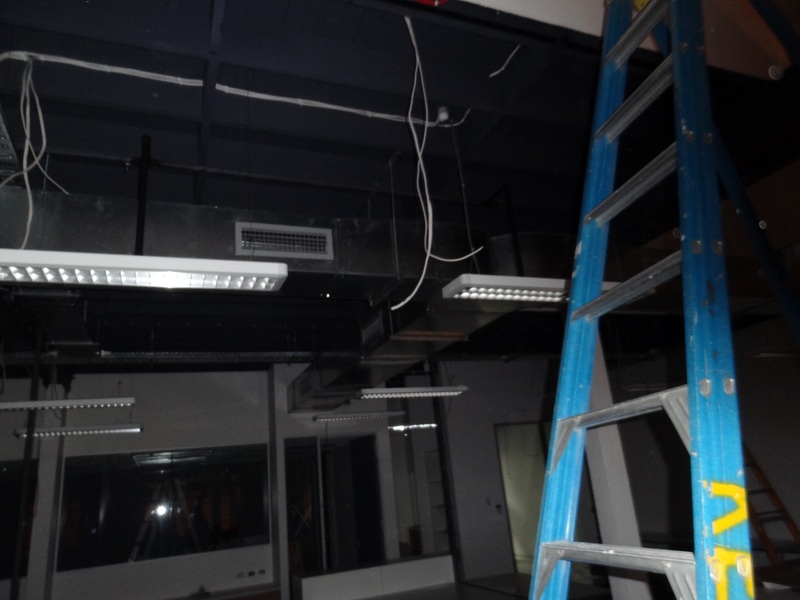 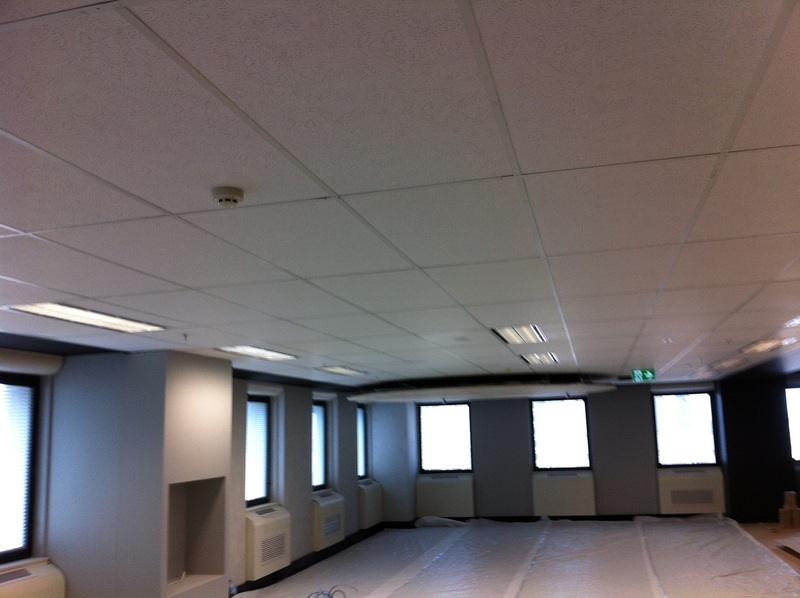 Office fit out in heritage warehouse style in Birkenhead Point offices. 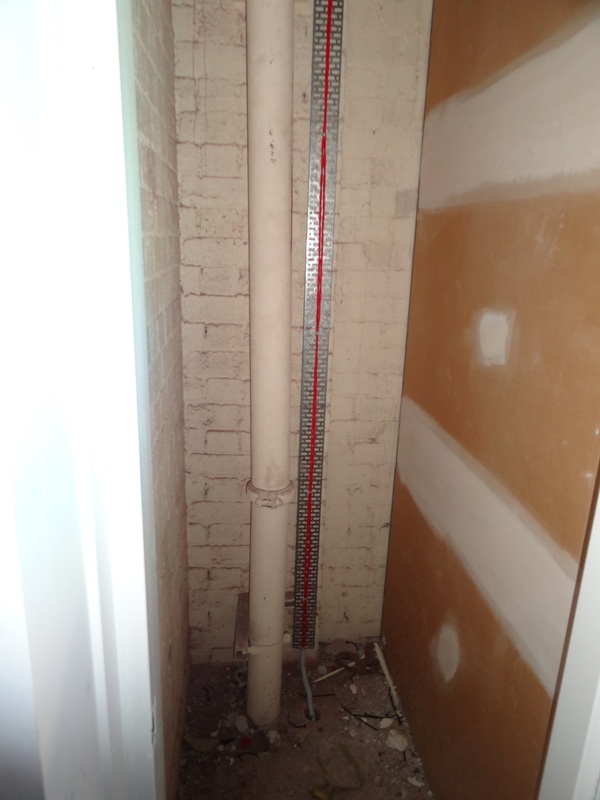 Pipe work and dry fire systems removed before demo and refitted to new lay out in exposed timber, tile and set ceilings, concealed space detectors, sprinklers and a fire trip was also installed. 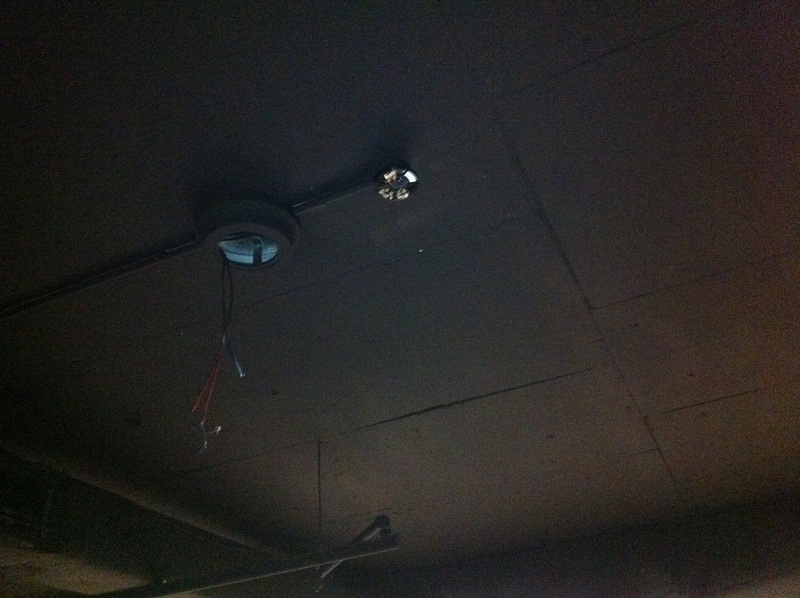 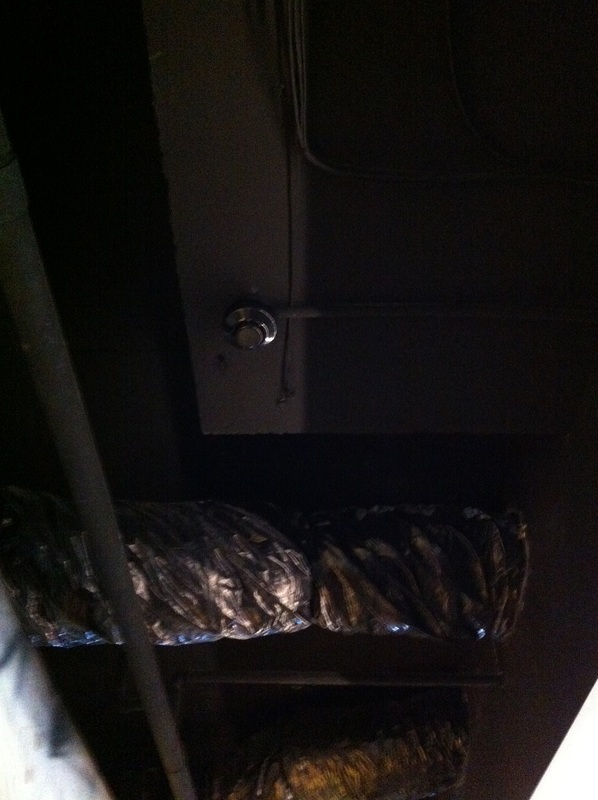 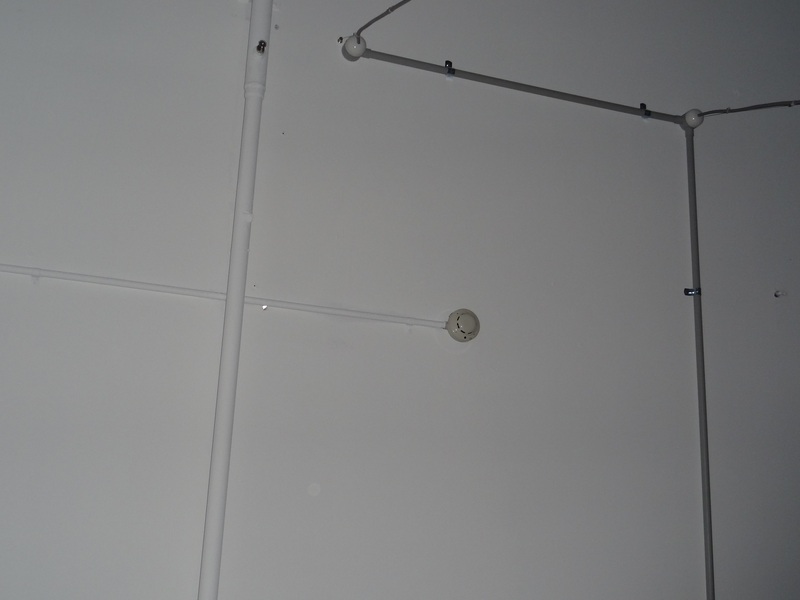 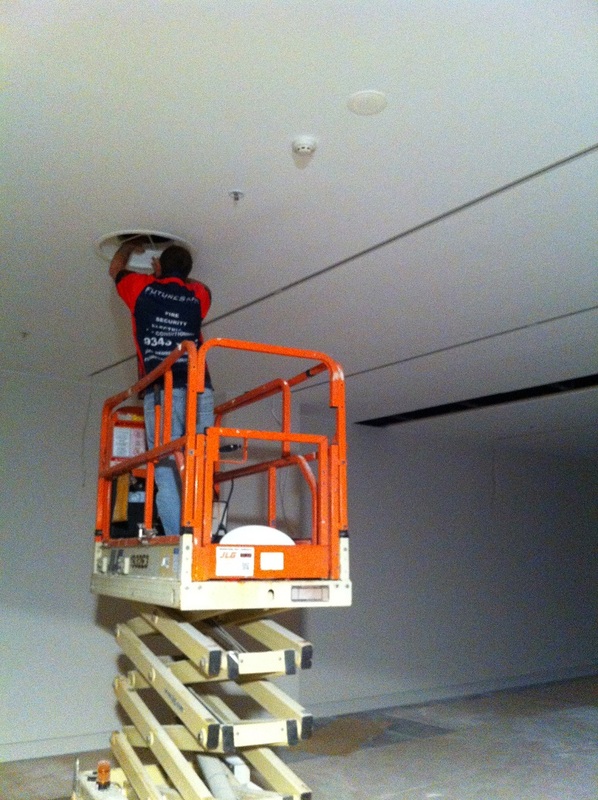 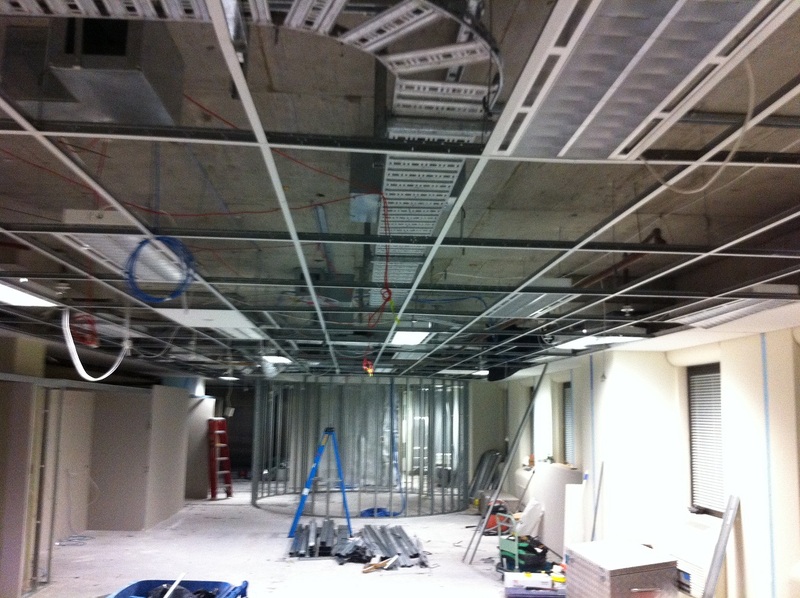 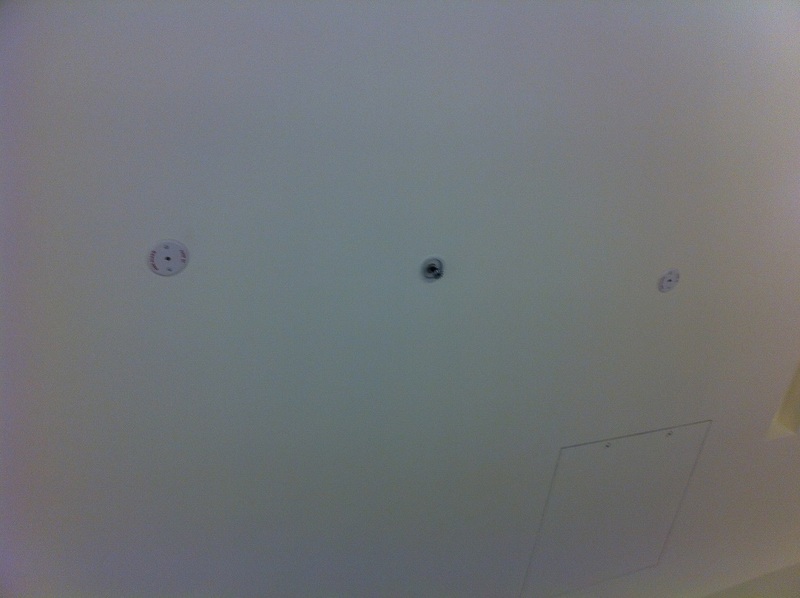 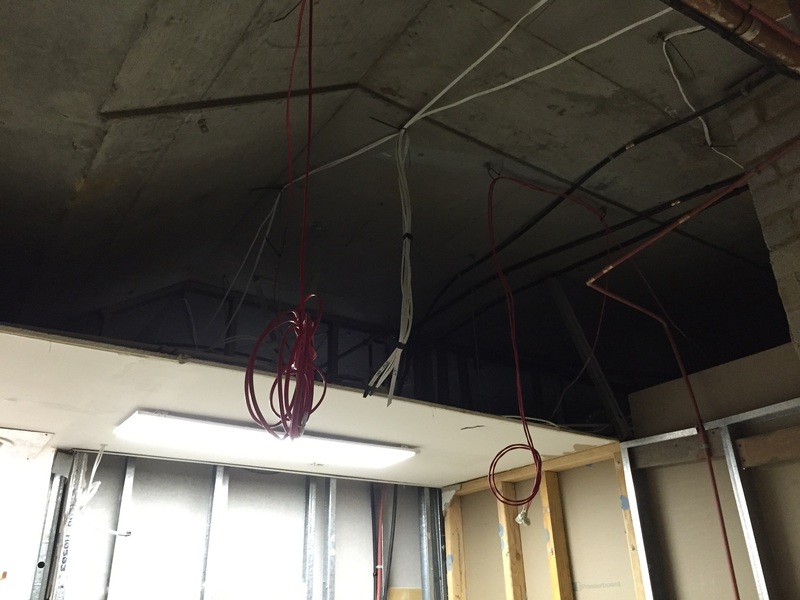 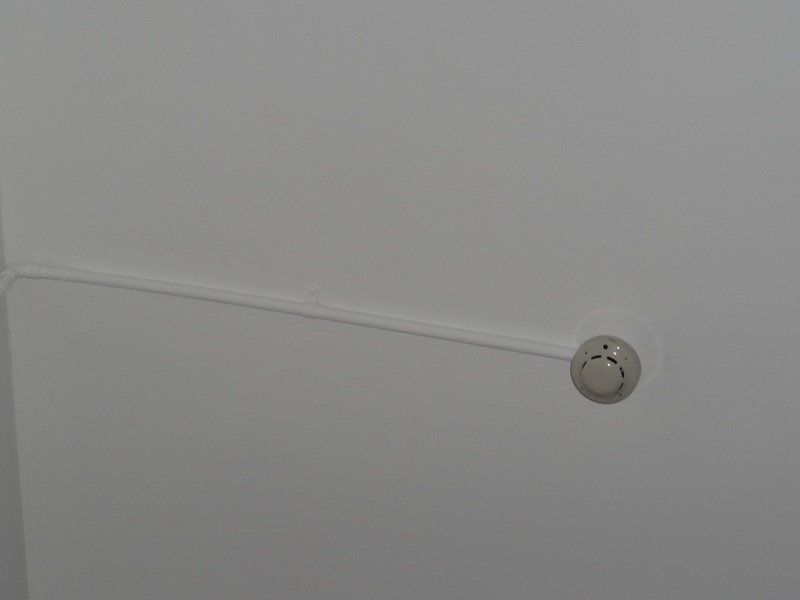 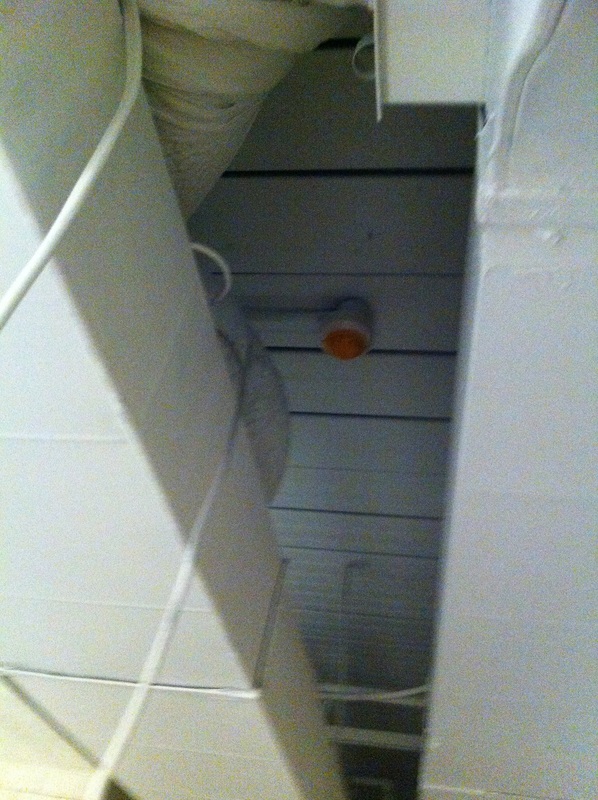 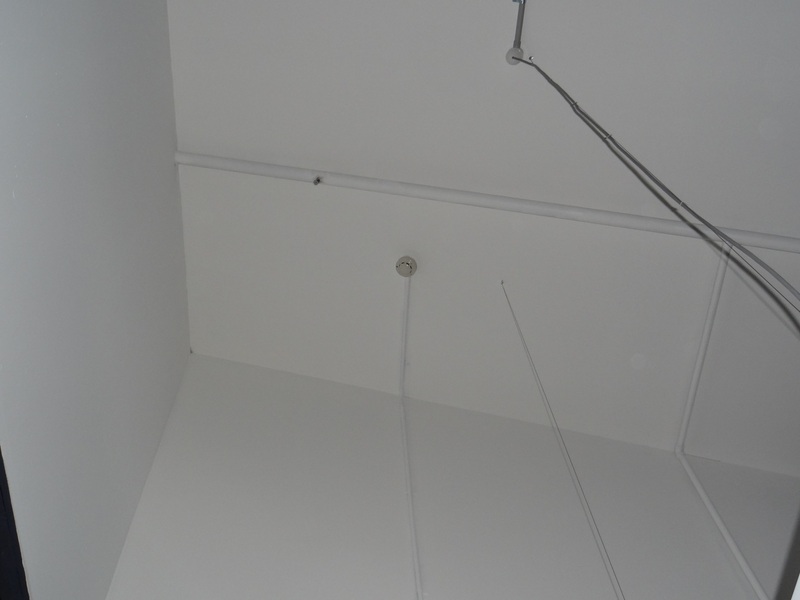 Sprinkler pipes had to be dropped to take into account new ceilings and new ductwork. 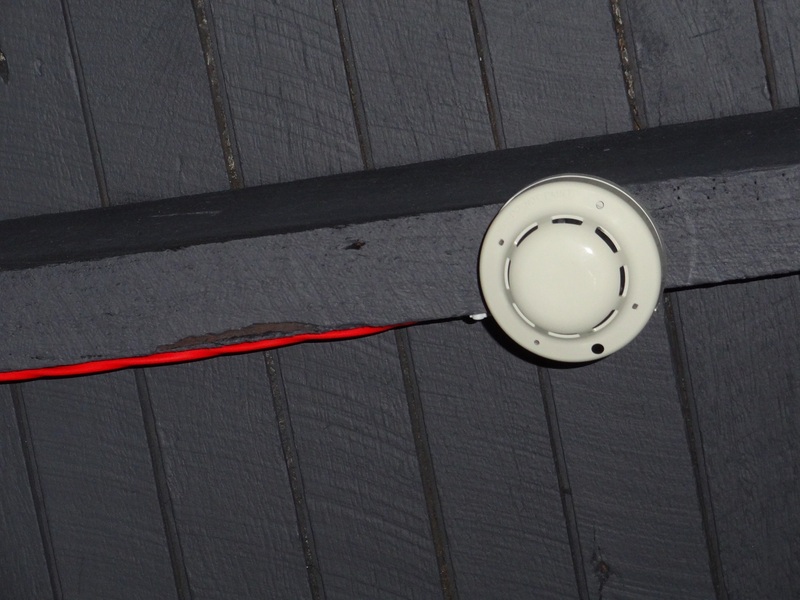 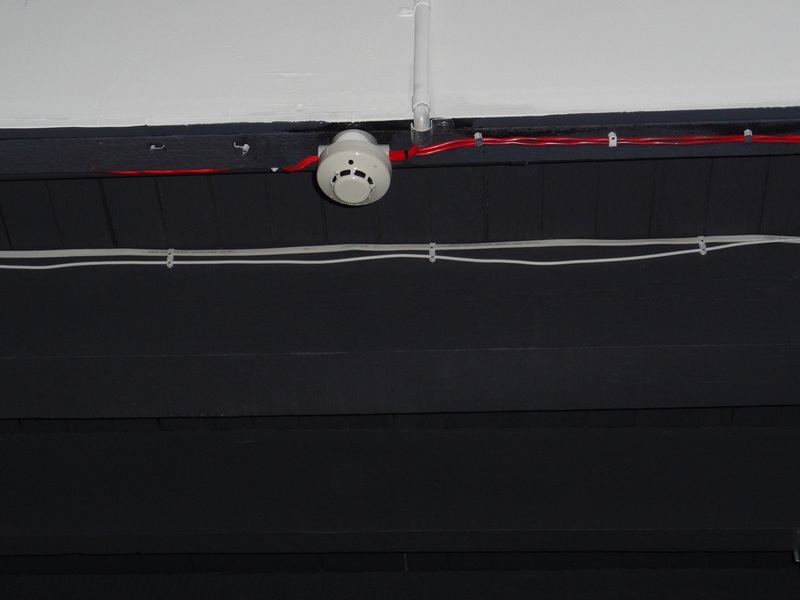 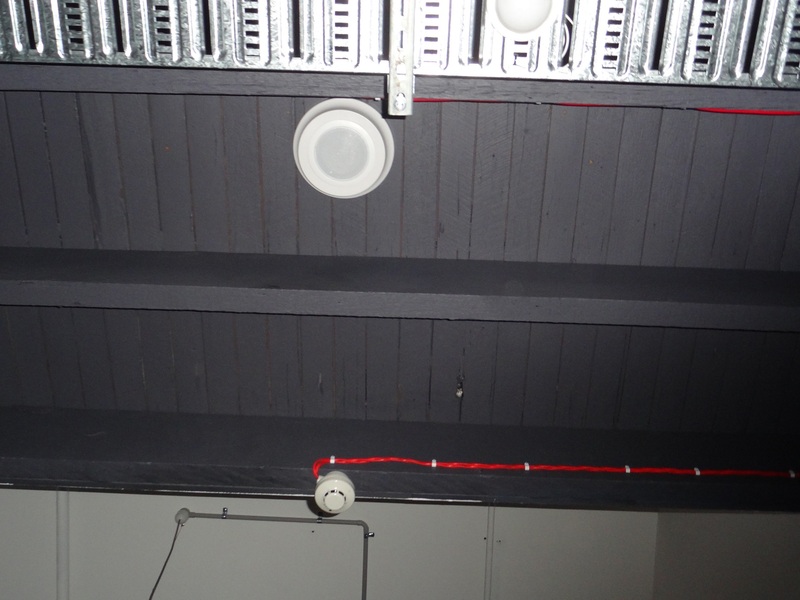 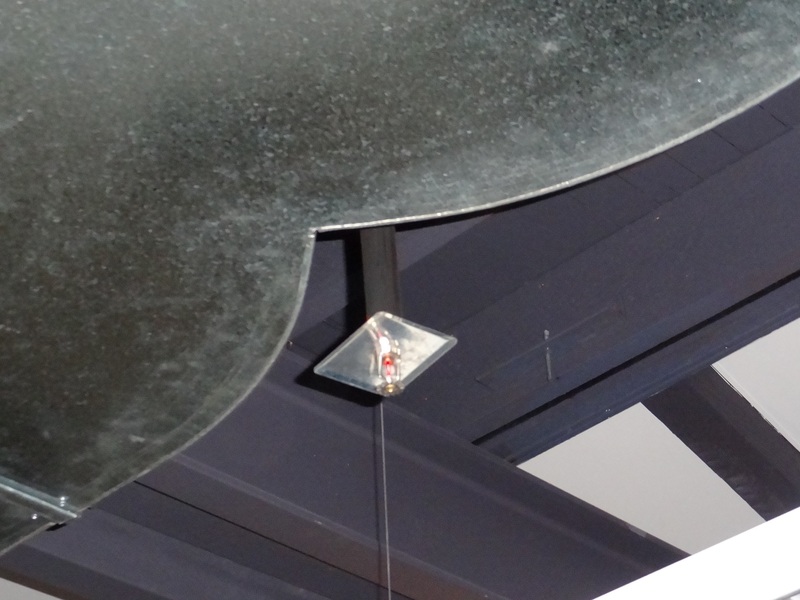 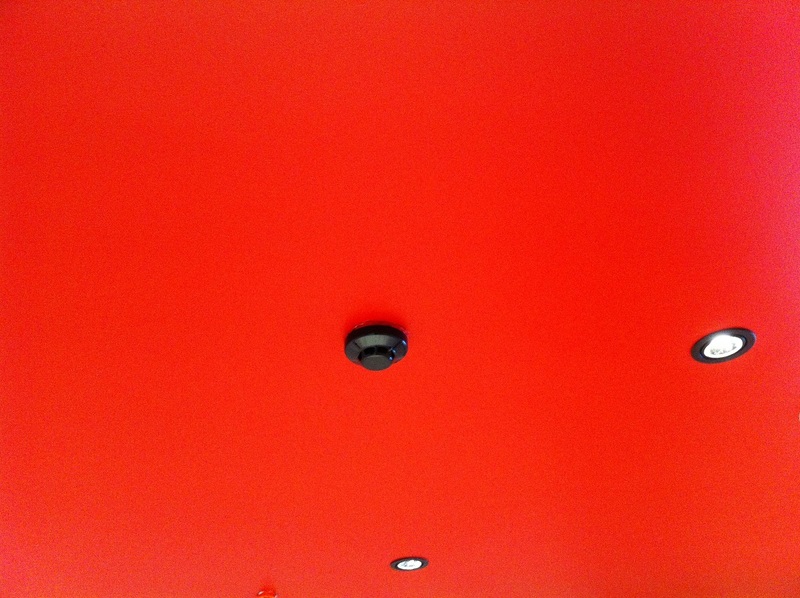 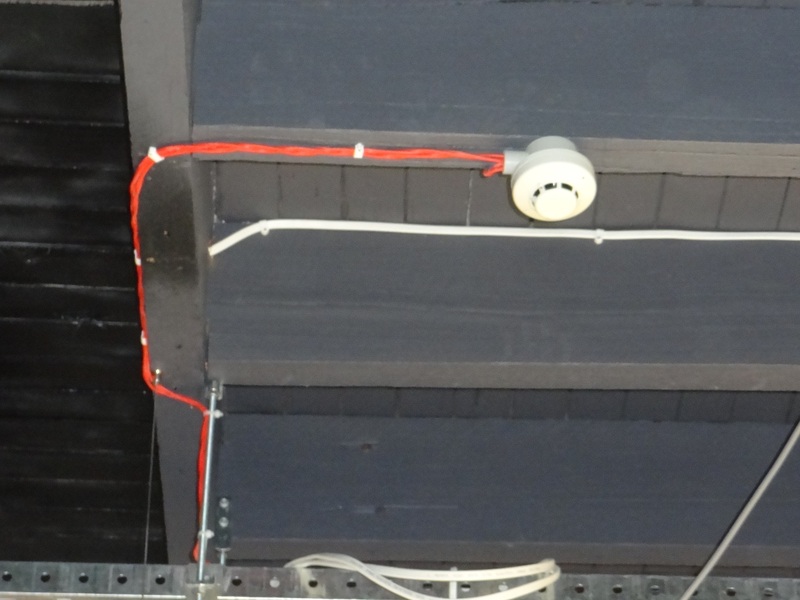 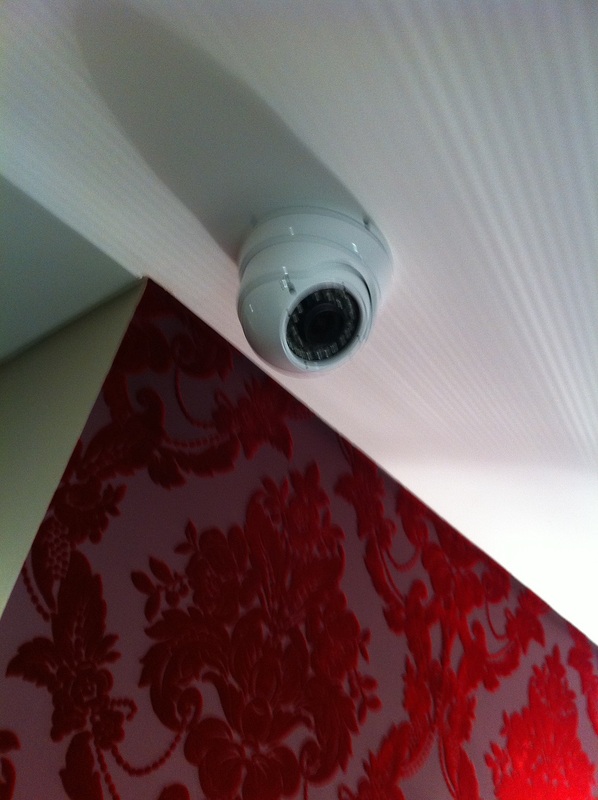 Client chose to have the red fire wire run exposed on the timber joists after painting to good effect. 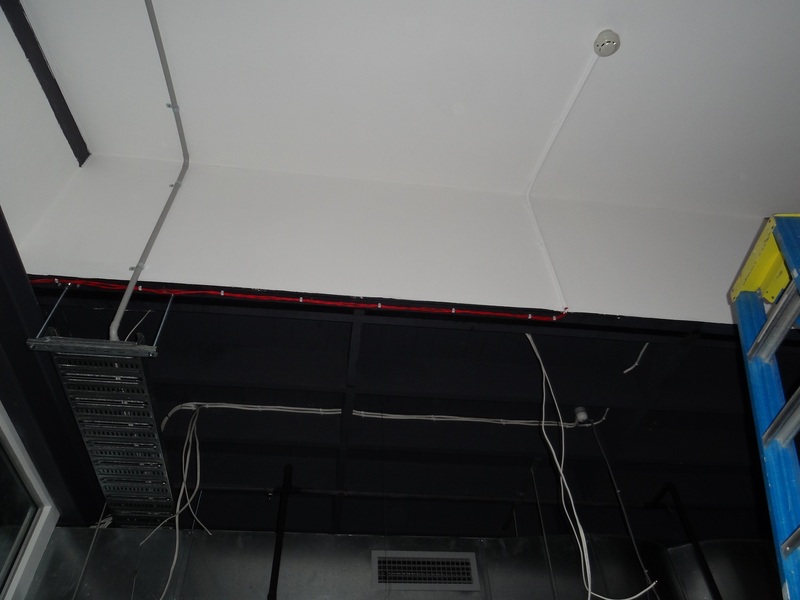 Unfortunately the addressable loop on the floor and the floor above and below was full so we had to run the loop for the smoke detectors to a lower floor that had spare capacity for the extra detectors, another great thing about a addressable FIP as if this was a full conventional circuit we would have to run new cable all the way back to the fire panel which in this building would have been extremely difficult. 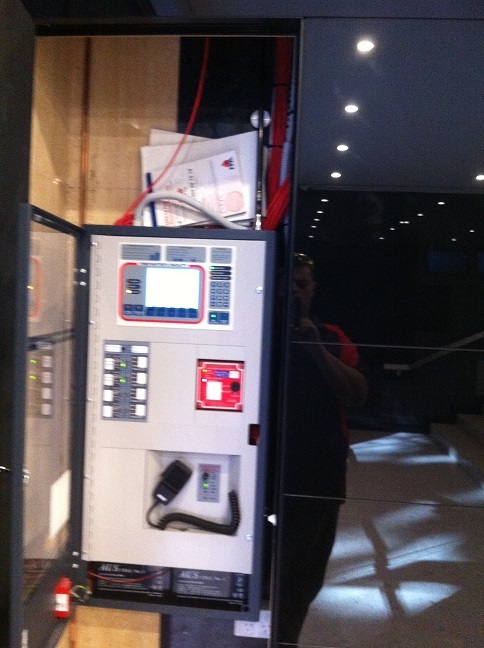 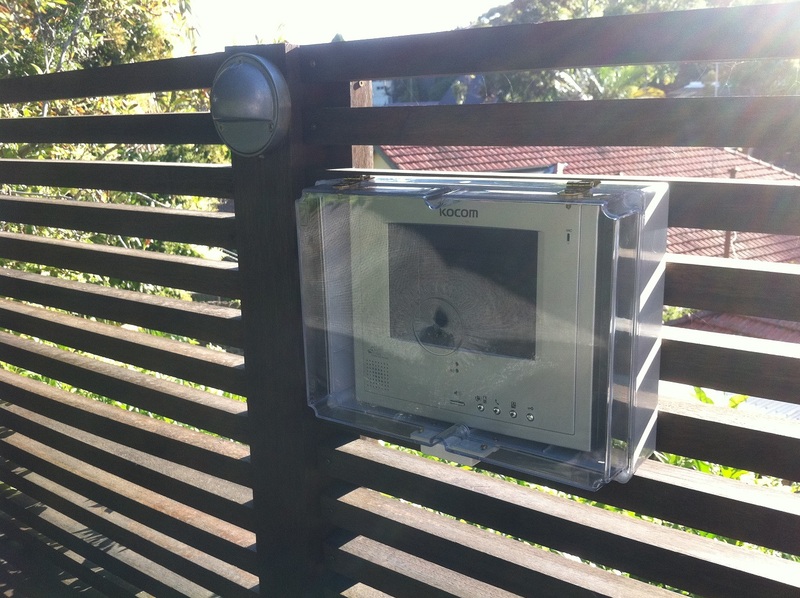 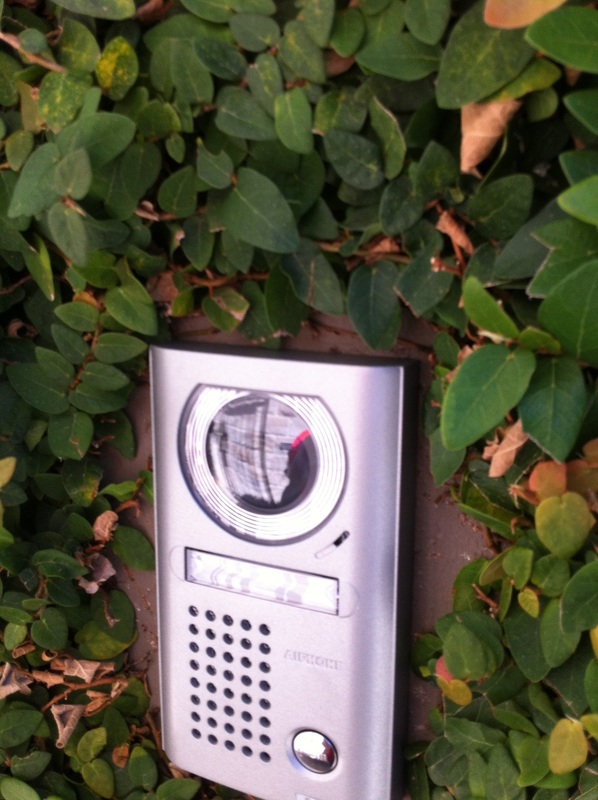 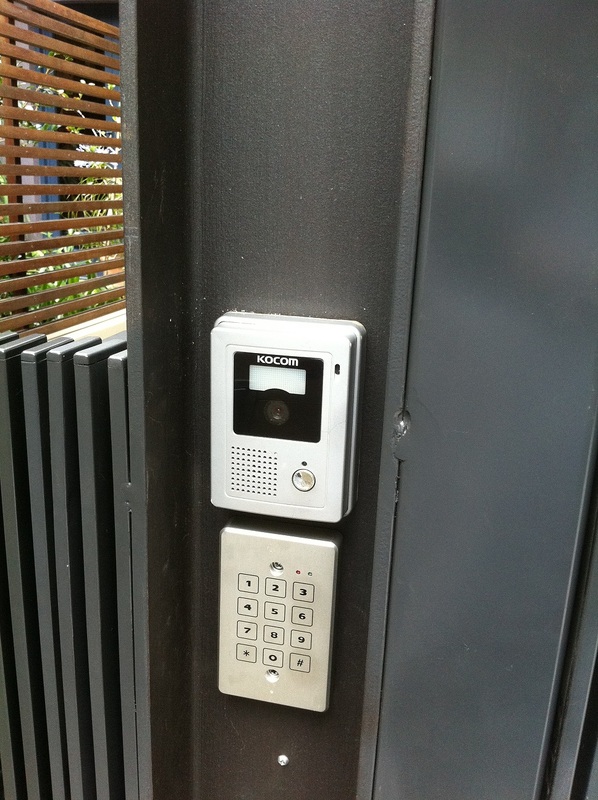 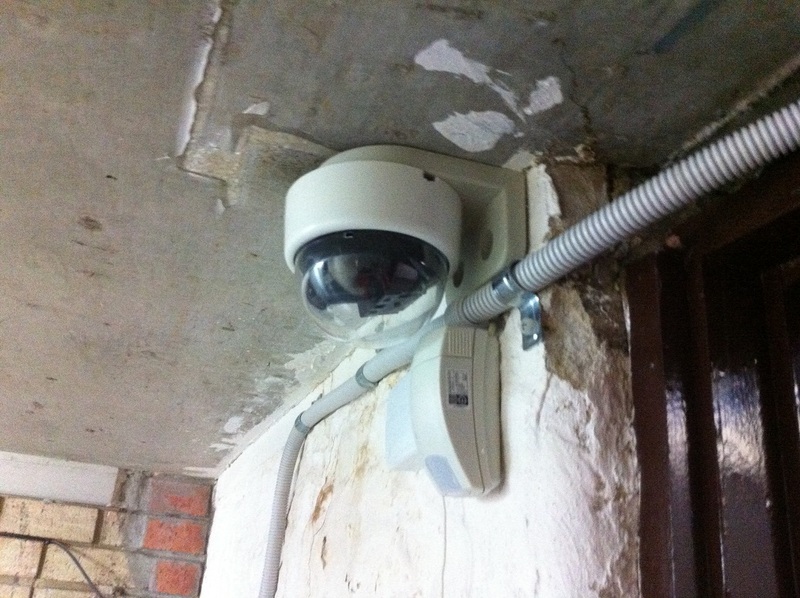 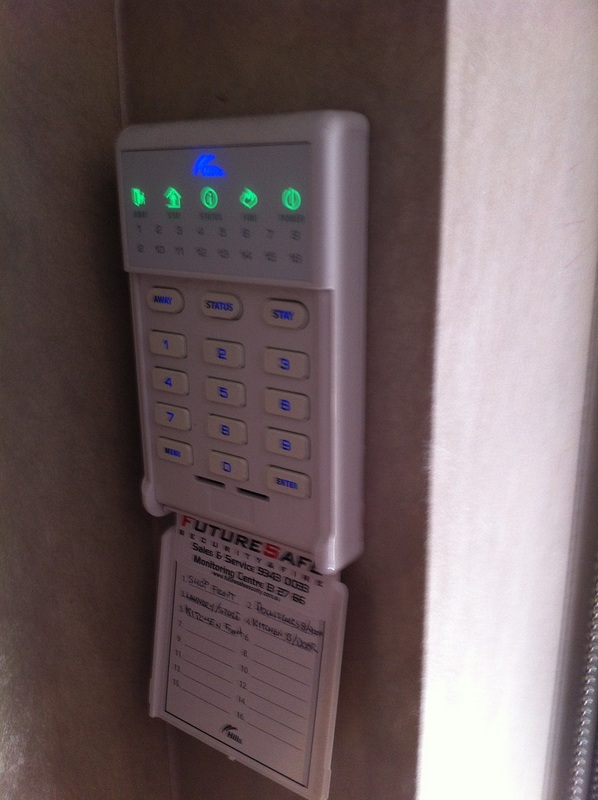 Aifone JF video intercom with Bosch alarm system installed throughout with automation. 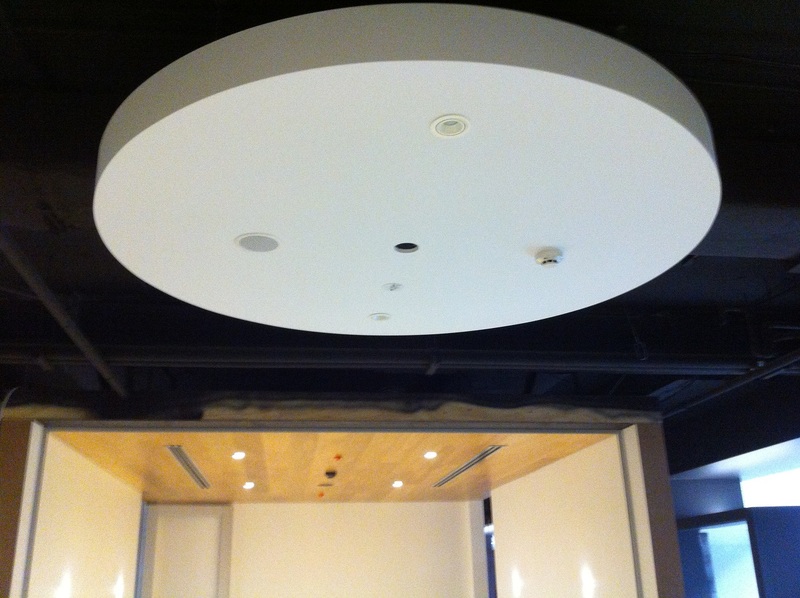 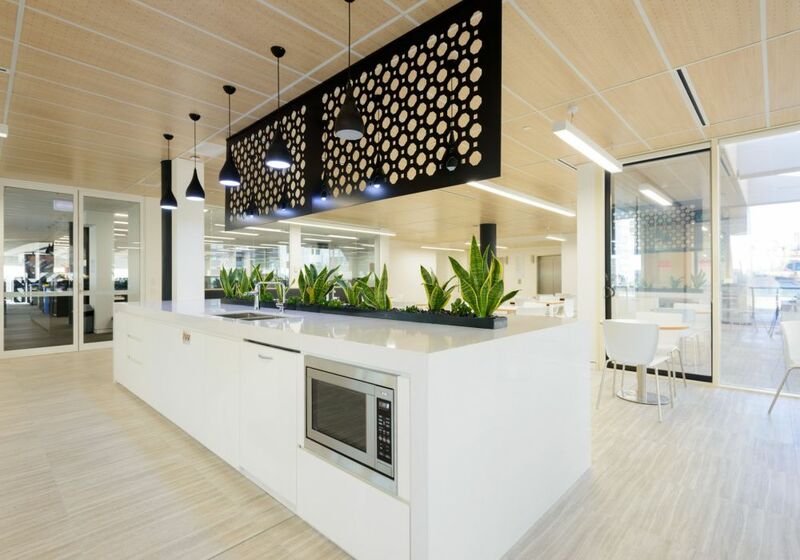 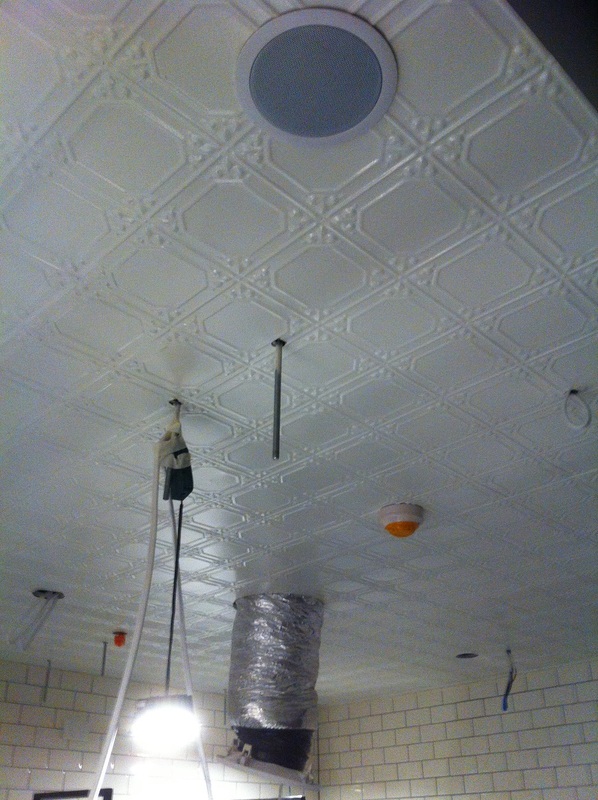 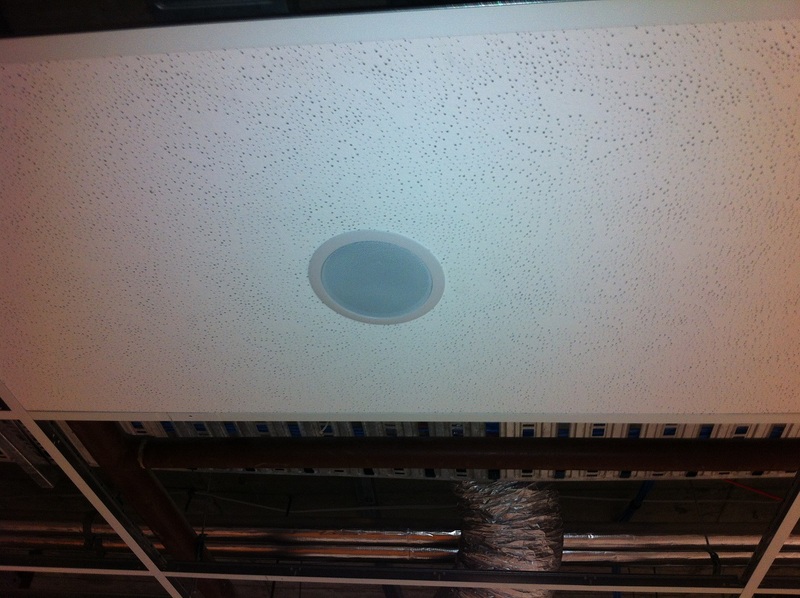 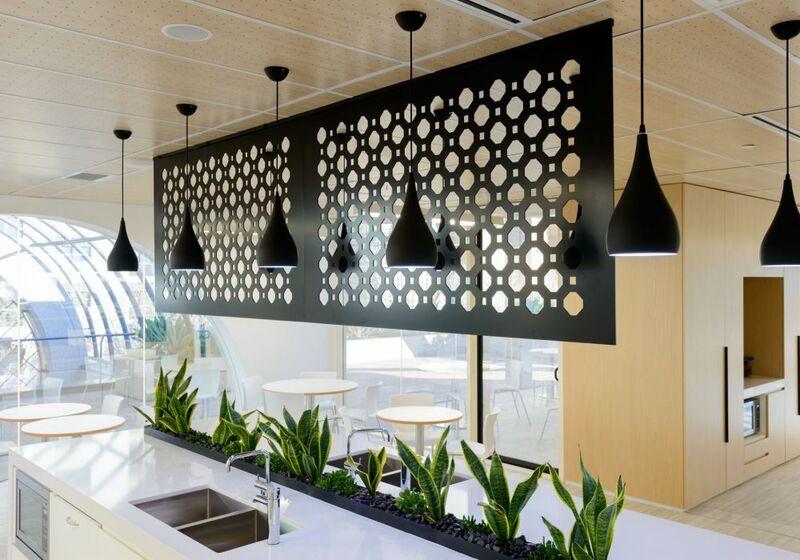 This site used a combination of exposed ceilings and pressed metal set ceiling.